Tron Legacy was released by Disney in 2010 but I did not see it until early this year (better late than never I suppose). I do remember watching the original Tron movie in the early 80s and, like many folks, being in awe of the incredible computer generated graphics. Of course they would be laughed at today. I love the second movie and its a shame that Disney seemed to have canned the idea of a third. 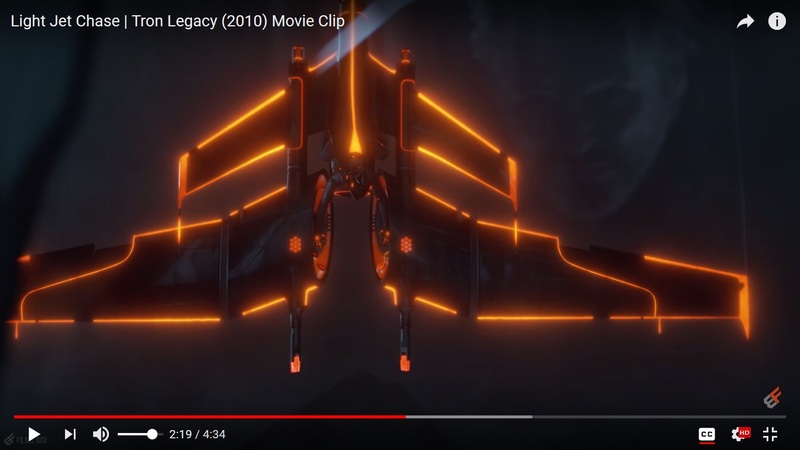 Obviously, the scene where C.L.U., Rinzler, and some hench-pilots in One-Man Light Jets chase the Flynns and Quorra in their Three Man version is one of my favorites and I became fascinated with the One-Man plane. 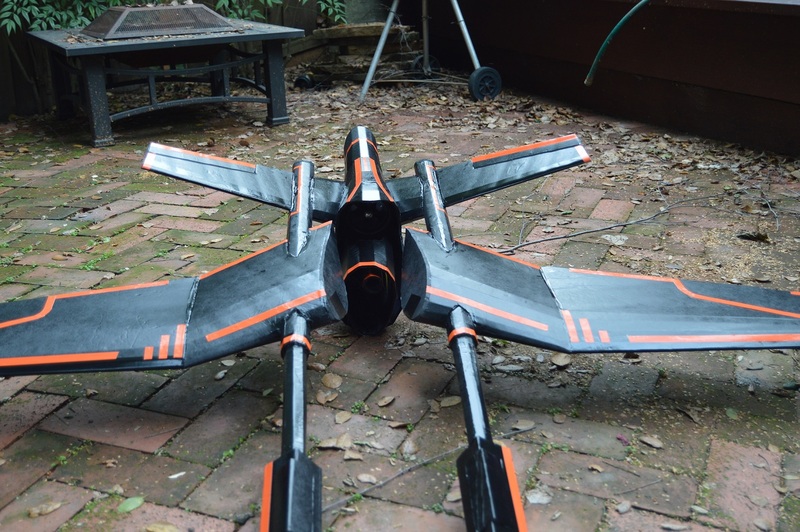 I simply love the design and structure and am keen to see if I can make and fly one. 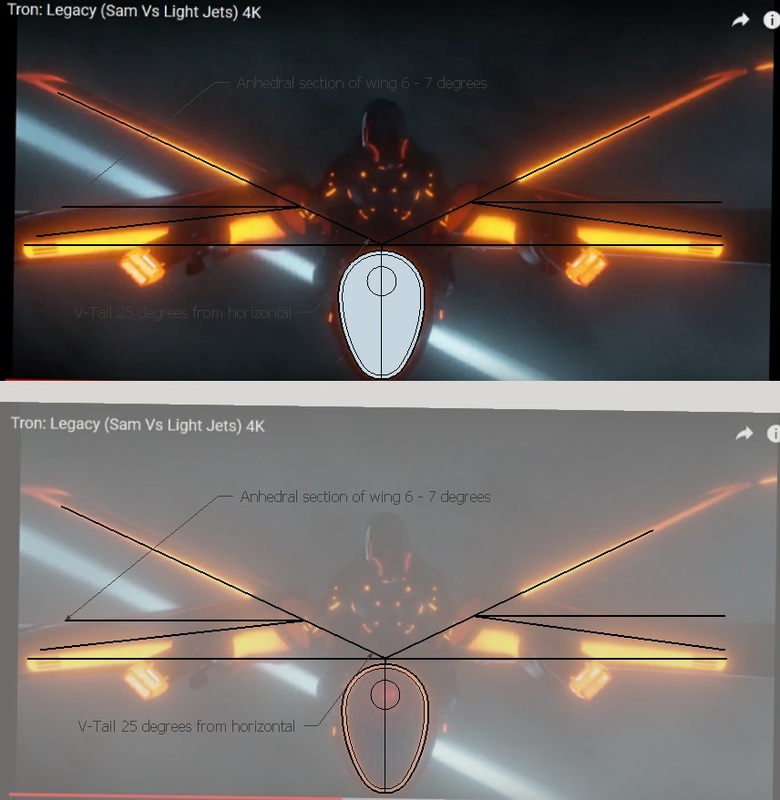 The vehicles for Tron Legacy were designed by a guy called Daniel Simon and technically, I should be calling it the "Single Light Jet" based on his title for the craft. The following images are linked through his website. Daniel's images are wonderful and are really useful for working out some of the details of the craft, how some of the entities are joined, how the shadows show where the curves live etc. Okay, the obvious is to build it, make it look cool, and fly it. But there are a couple of challenges that I think will be interesting to deal with. 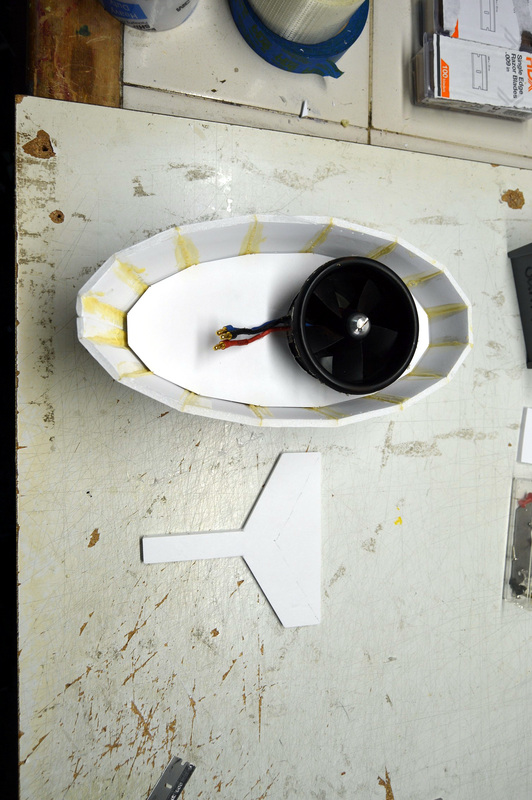 The first is the fact that the wing is not mounted to a fuselage per se. Instead it is mounted to the v-tail via pylons. In my best attempt I would like to replicate this feature without cheating. 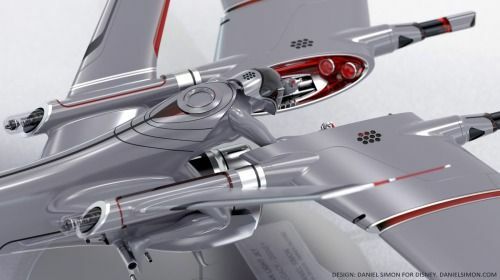 The second challenge is that the way the plane is structured, there is almost nowhere to add weight in front of the CG. The only viable option is to have the weight (in the form of batteries, electronics, or dead weight) added to the front of the pylons. Looking at the plan view I think I may have to extend the pylons forward to make this approach work. Also, if I intend to put batteries in the pylons, then the minimum pylon diameter will need to be in the 2'-3' range and to keep the pylons even close to scale will require a pretty big build. That's it for now on the light jet. 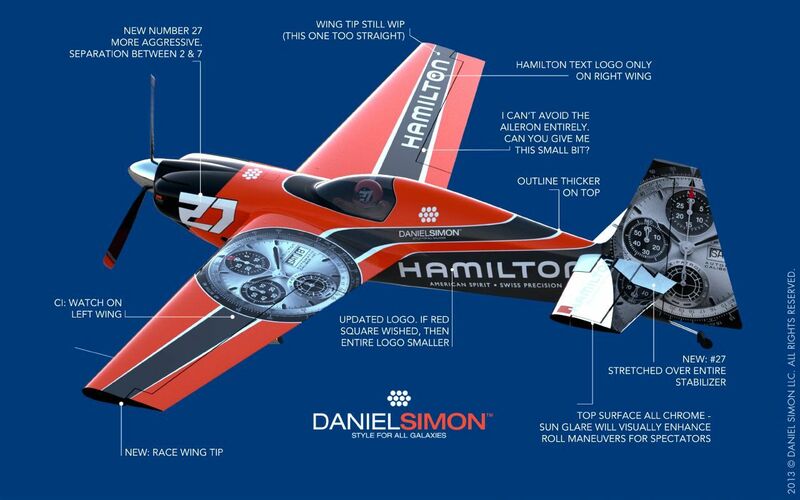 I described in the introduction how Daniel Simon's images were excellent starting points for the design of the plane. But three-views they ain't. In fact there are no good three views available that I could find. So I decided to use some of Daniel's original artwork and screen captures from the movie to establish the profile, plan, and front views that I would need. I can use this profile picture from Daniel Simon - not 100% straight on profile but I can make it work. Then I took to Youtube to grab some screen captures from videos of the Light Jet scene. Of course, those of you who have seen my earlier posts know that I already had started on a Sketchup model of this, so I already know these pics will work (-ish). But the images are not perfect and there are some inconsistencies between some of the concept art drawn for the model and how the model actually appeared in the film. 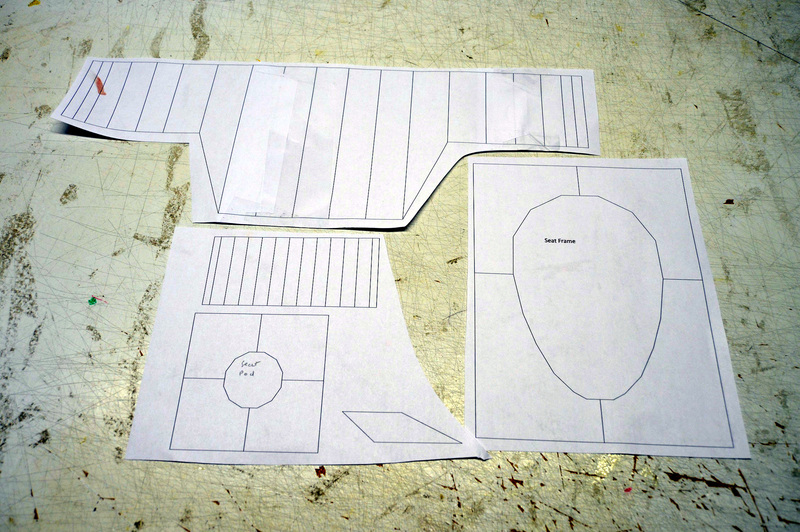 So this is the plan view drawn in Sketchup using the screen capture image. 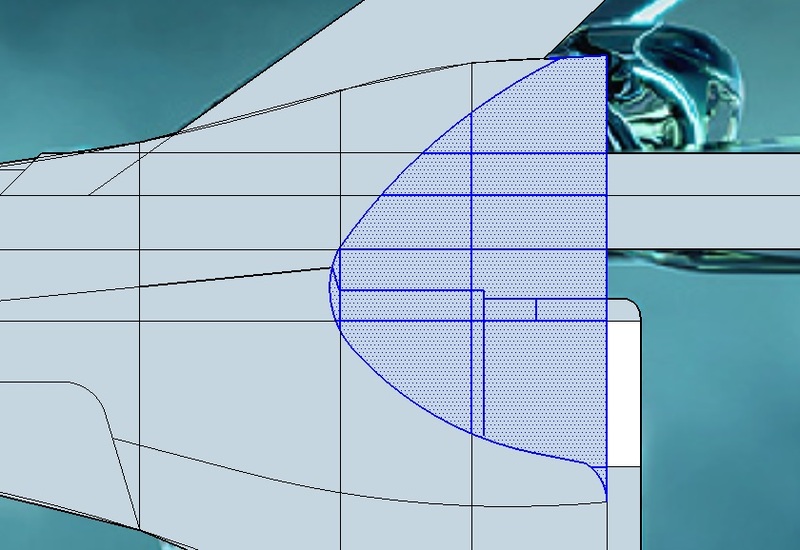 The wing, v-tail, and pylon are drawn as simply as possible. Only one half of the plan view is needed. The pic shows the panel in solid form (top) and using the "x-ray" view (bottom) so you can see the original plane in the background. Ignore the dimensions shown for now. These were added so that I will be able to scale the various views (plan, profile, front) with each other, a step you would not normally have to do if using a regular three view. 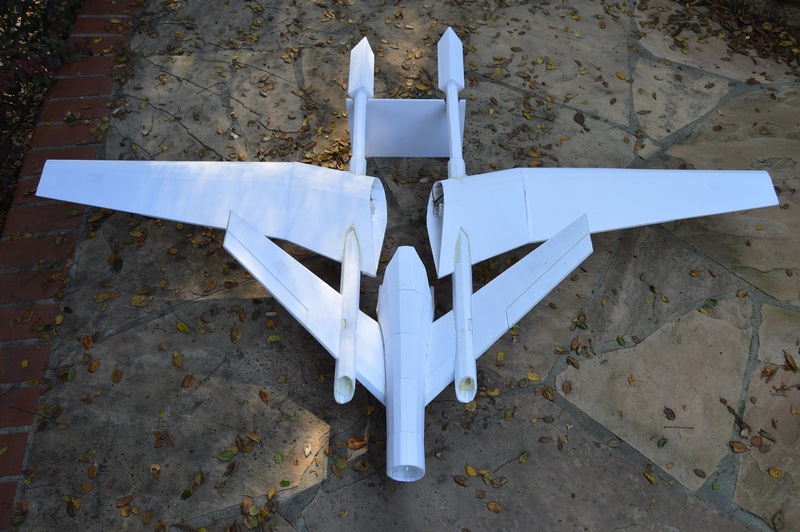 The front view was mostly used to establish some basics around angles for the v-tail and wing. 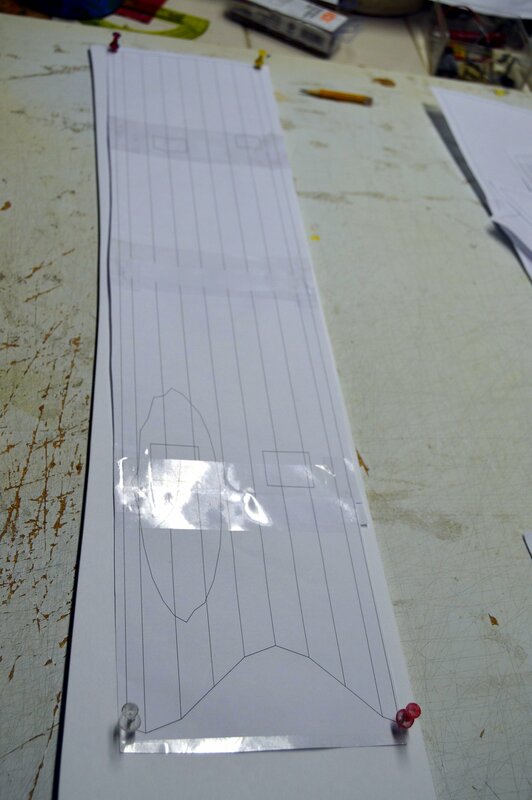 Although the picture is not 100% from-the-front, it will work and I can make modifications later as the design progresses. So I have ~25 degrees (from Horizontal) for each of the v-tails (making the v-tail angle 130 degrees, which is probably a little on the large side from what I have read about v-tails). But it's a good starting point. Also figured about ~6 or 7 degrees down angle on the root section of the wing. I am assuming the remaining wing is level. 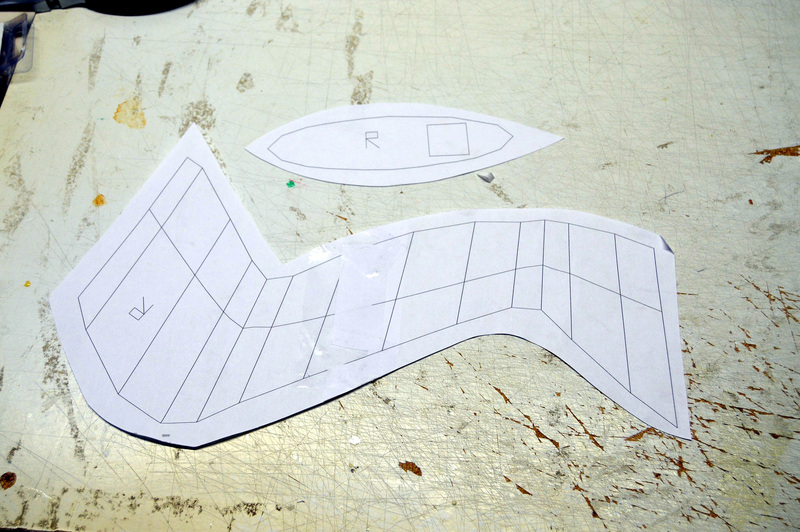 Lastly, I can use this view to establish a shape for the "grill". Again, solid and x-ray views are presented in the pic. 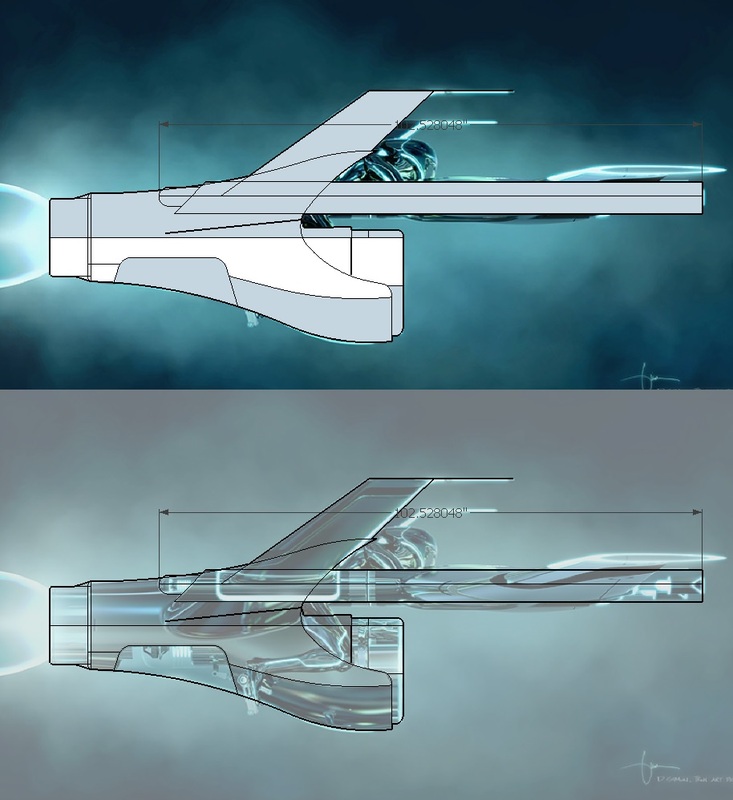 The initial profile drawings mostly help capture the shape of the "fuselage" for want of a better term. 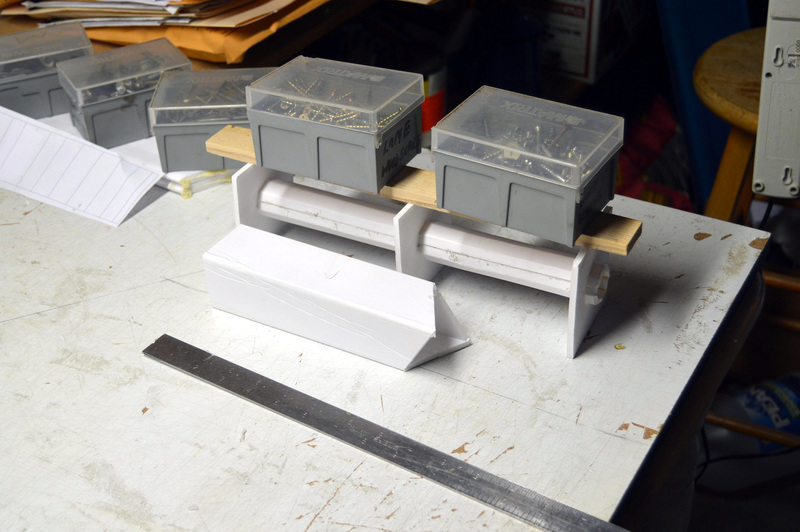 It also provides a second look at the v-tail and pylon setup which will help establish the positions of these parts in the final model. 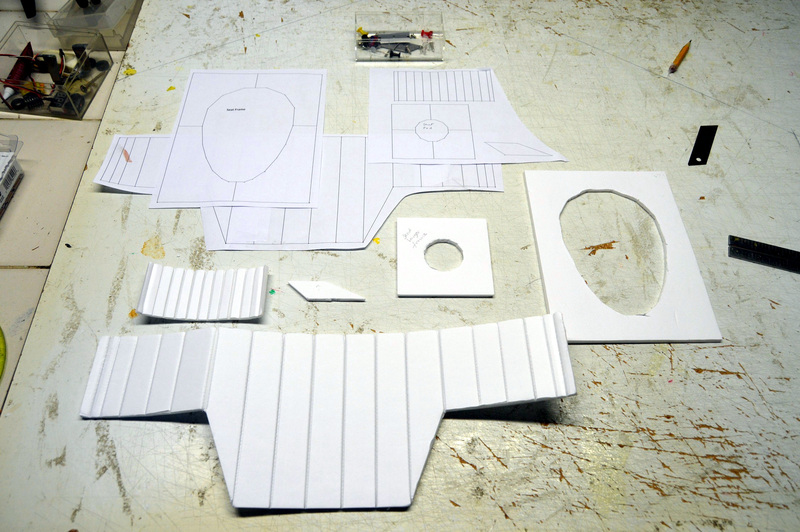 Next up was to take the wing and v-tail panels from the plan view and set the angles in 3D space. To to this requires making a new panel that can be rotated to the desired angles and then transform the points from the original flat piece onto this surface. The same approach was used on the v-tail section. A symmetrical airfoil model was added to both mostly to improve the looks of the model in SU. 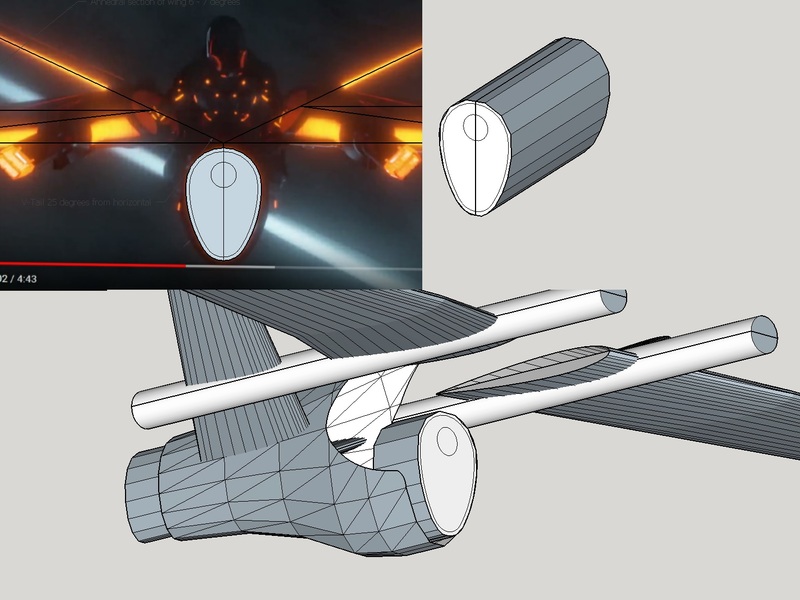 That being said, I am very impressed with the construction and performance of the FT Edge airfoil so using this as a template is a possibility. These airfoil objects are grouped with the original flat panels in Sketchup so I can view or hide either part depending on what I am trying to model. 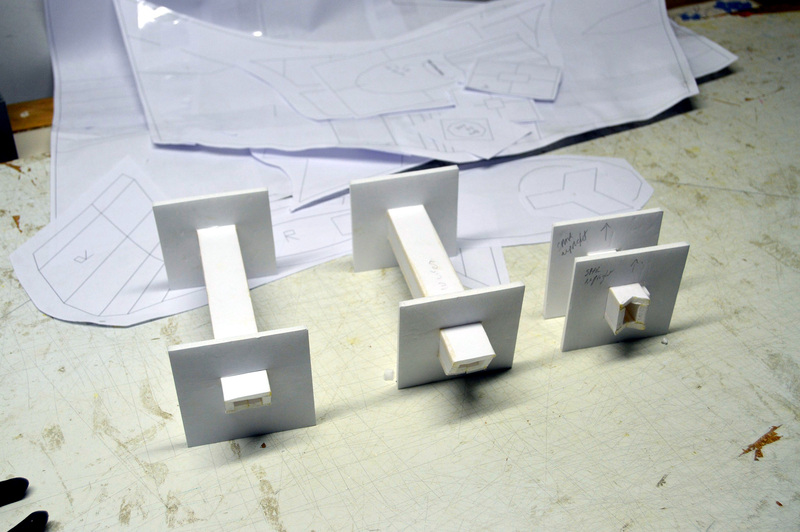 Next up was to map these pieces onto the plan view again to that their spatial position in the model can be established. When the original flat panels were drawn I kept the center line of the pylon in the panel so following the adjustment of the angles the parts could be aligned exactly with the pylon and be in the correct position. 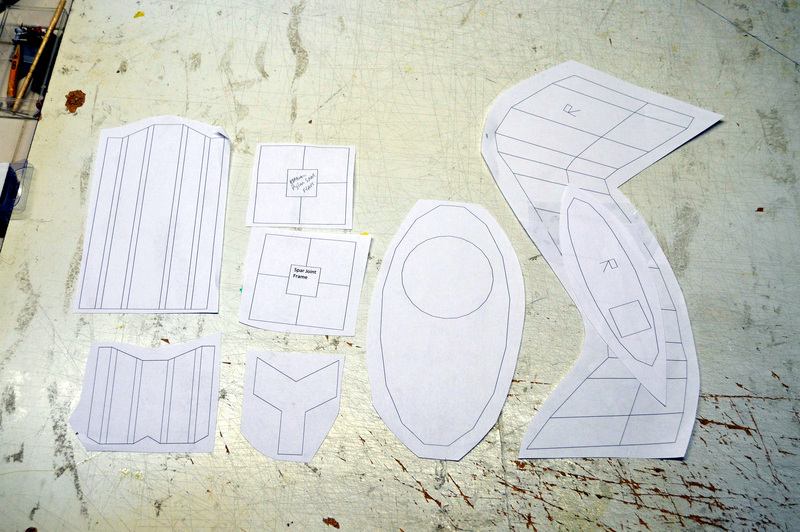 Here is the plan view with the parts added back and you can see how they now fit in 3D space. With a simple cylinder model of the pylon made, and the wing an v-tail aligned, the mirror image can be copied into the model to get a feel for how she is going to look. Although this looks okay, I am a little concerned at this point that the V-tail is too flat. So I made another one at +10 degrees (bottom panel in the next pic). This would reduce the v-tail angle from 130 degrees to 110, which is more typical but to keep the same planform its a lot longer. 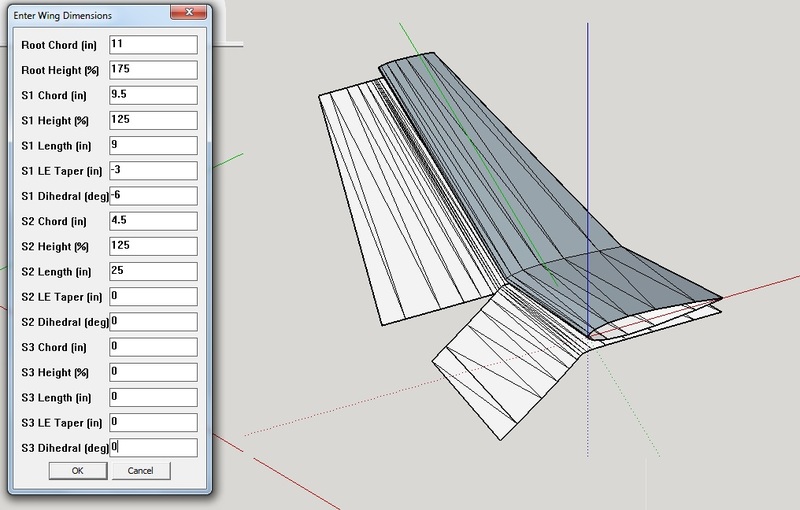 I needn't lock into one or the other yet, changing later in Sketchup should be pretty easy. Back to the profile view, this time tracing out the fuselage. I left the pylon center line in place to help with alignment with the 3D model. 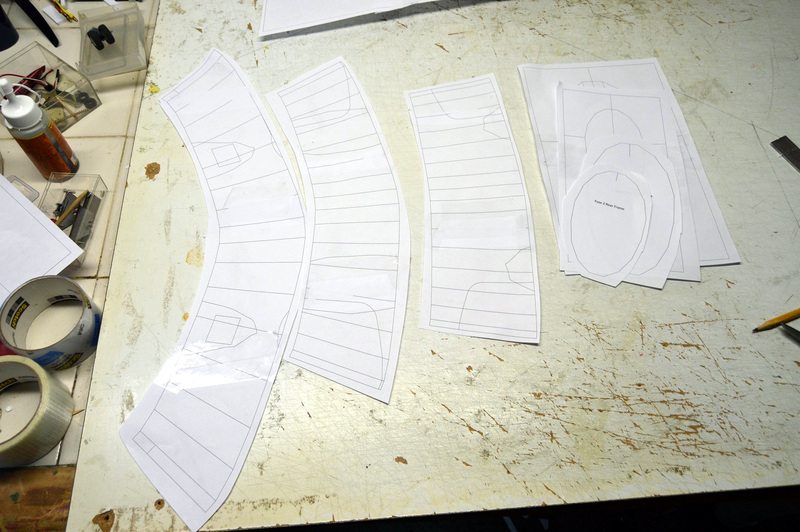 At this stage its okay to use all manner of curvy bits to get the shape right but ultimately, to convert this to foamboard, some of the curves will need to be "averaged out" to straight sections. Cues to the 3D shape can be taken from a couple of images. 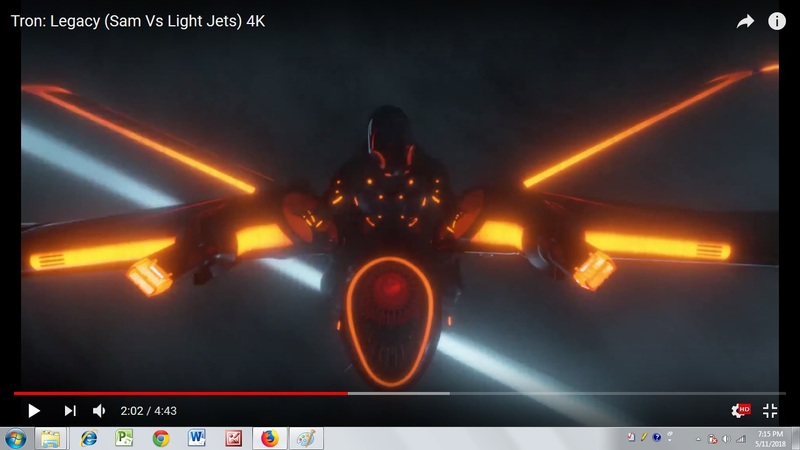 A screen capture of the jet being formed in the movie shows that the basic shape is composed of oblong/circular/elliptical type rings and they are all pretty much the same shape (which makes things easier). 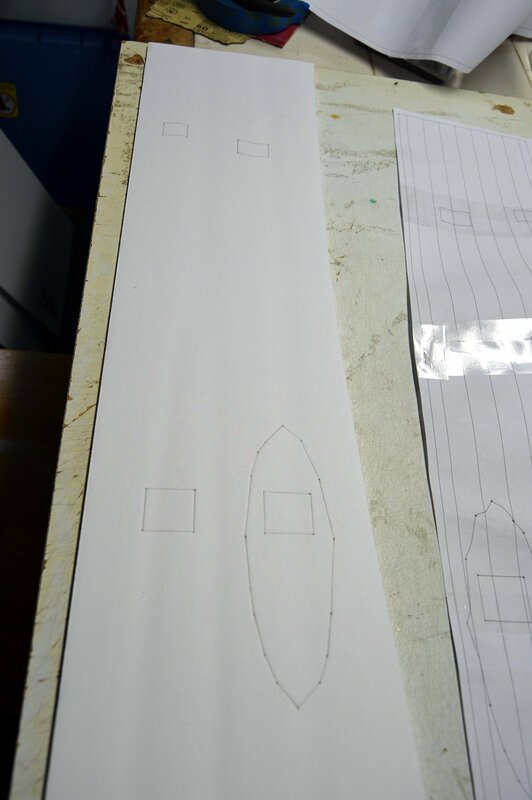 From one of the images of the rear of the craft you can get an approximate view of the shape. So a simple circle shape was added, then the width was reduced and finally a slight further narrowing of the lower portion of the ring was completed. 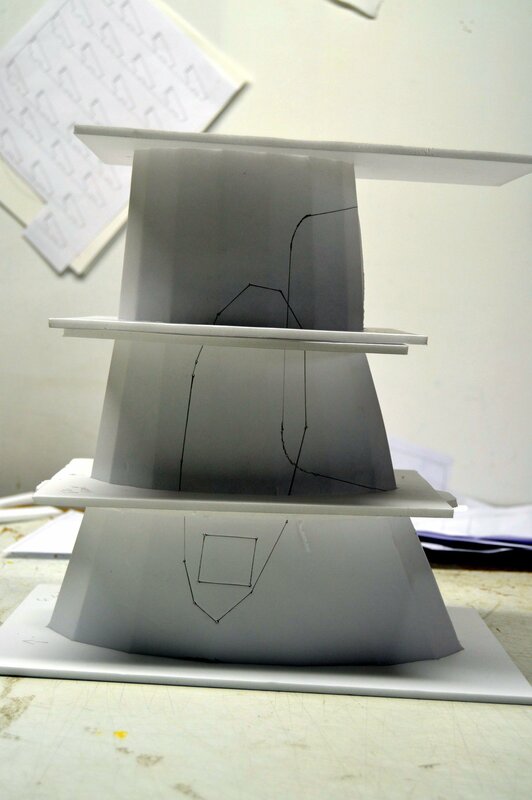 This will be the cross sectional former to model the fuse in Sketchup. Hard to tell if this is a really accurate representation of the whole fuselage cross section but I think this will do the trick. 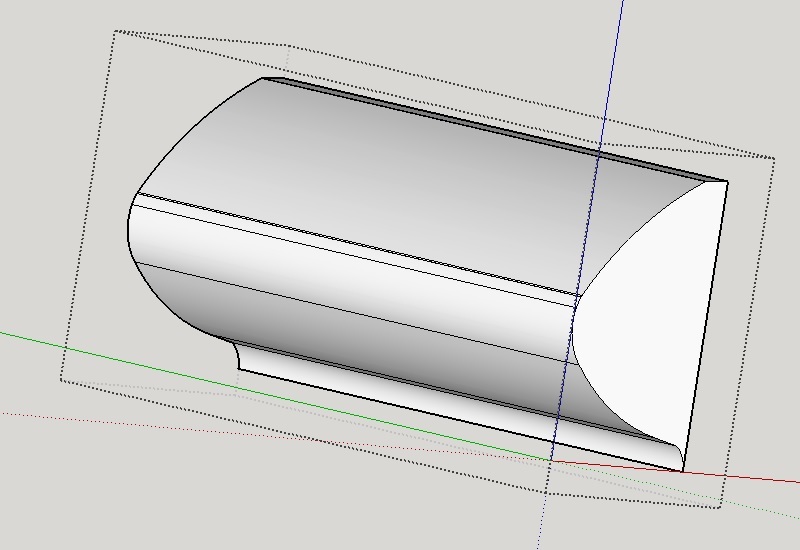 Next is to "cut" the profile view of the fuse into manageable sections. Given that I am going to use the score cut / gorilla glue / fold / frame approach, I need to average out some of the curves with straight lines keeping in mind that I would like to keep the fuse to four, maybe five sections. Okay - that ended up being 6 sections. Now this profile and the cross sectional profile are combined to build out the 3D fuse. The former is copied to each section of the profile keeping the centers aligned (1) . Then it is re-sized so that the top of the former meets the profile and the center of the former stays on the center line (2). The former is then resized again, this time pulling only on the bottom of the former so that it aligns with the bottom of the profile (3). Finally, the formers are planked in-silico (4). This planking piece is a little tedious. 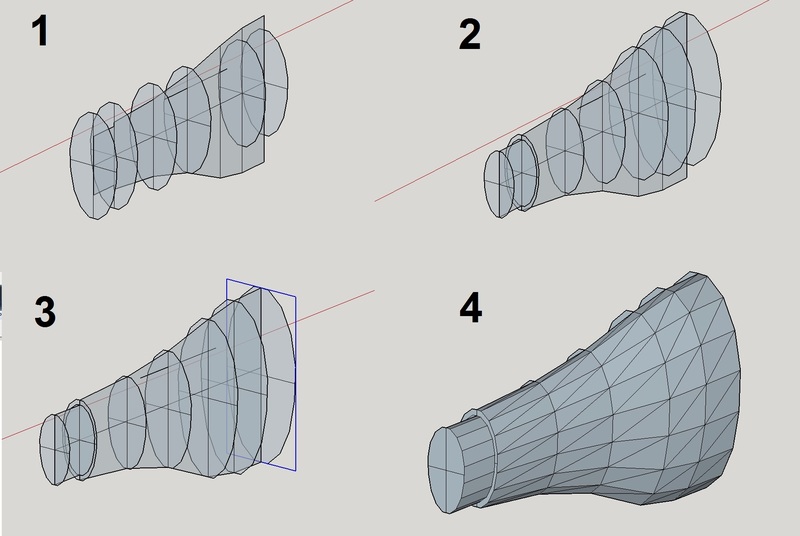 Although Sketchup has an extrusion type of tool (called Push/Pull) I find that the slower "join-the-points-by-hand" method gives me better control over how the part turns out. With one half planked, its mirror image can be made so that the whole fuse piece is now modeled. 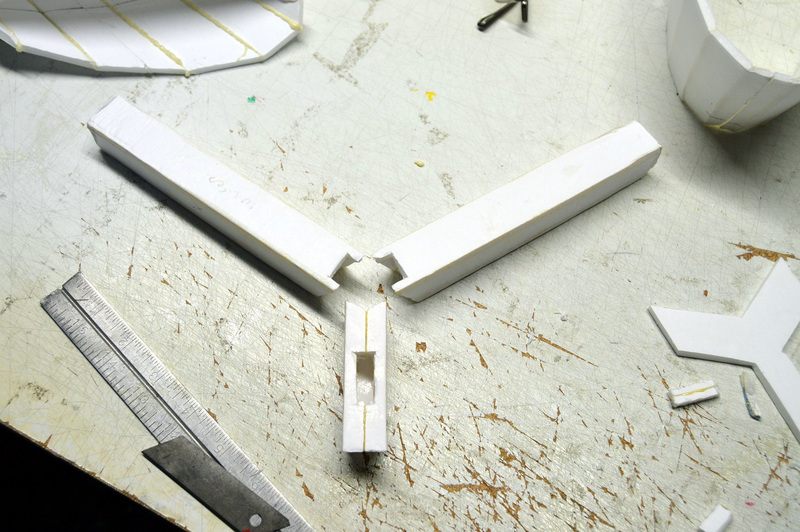 Using the pylon lines as a guide, this piece can now be inserted into the wing/v-tail/pylon part of the model. Lookin' purdy good at this point. To finish the fuse the front needs to be sculpted. The part highlighted in the following image is what needs to be removed from the front of the fuse. This portion is copied, cleaned up, and extruded into a 3D shape that can be subtracted from the fuse. Then the faces of the two pieces are intersected and the intersection line produced is used to remove material from the front of the fuse. Next up is the light engine intake. 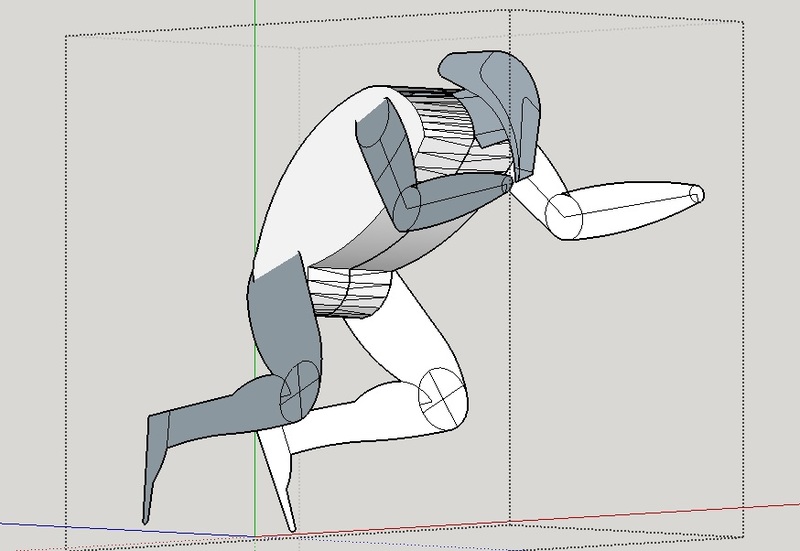 Taking the shape from the head on screen capture, a 3D element was drawn in the same way described for the fuse. 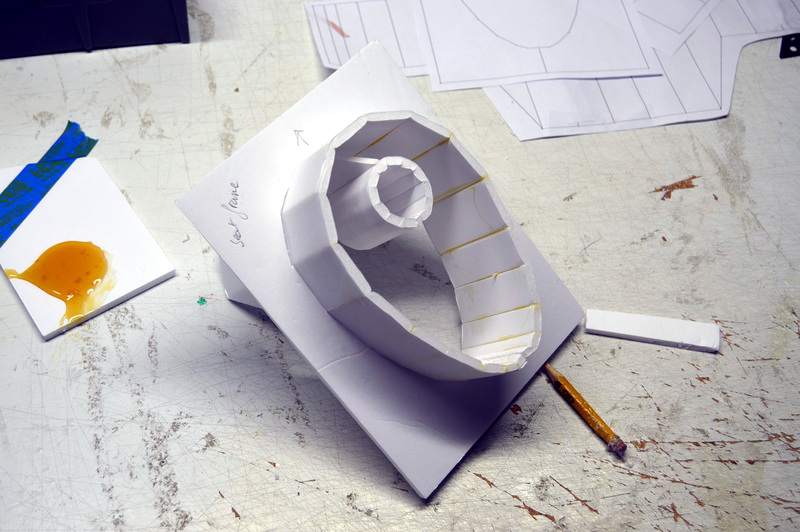 Then it was inserted into the existing model and scaled to fit. 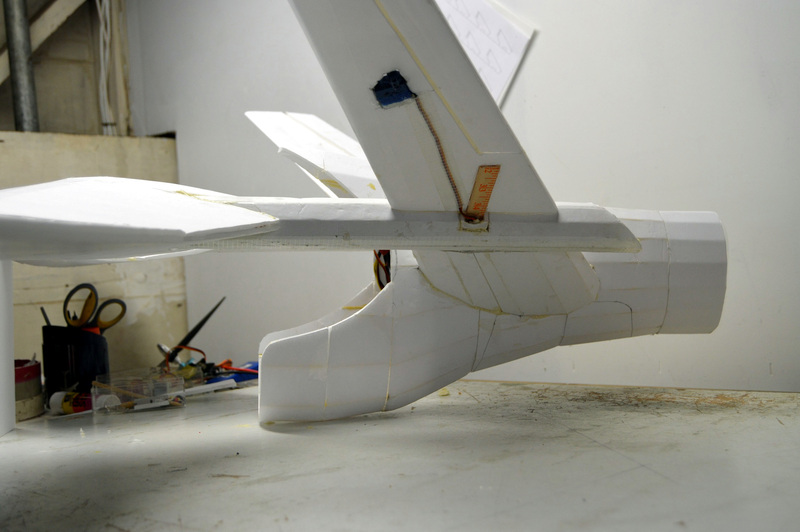 One of the challenges for the build is to be able to balance the plane appropropriately. 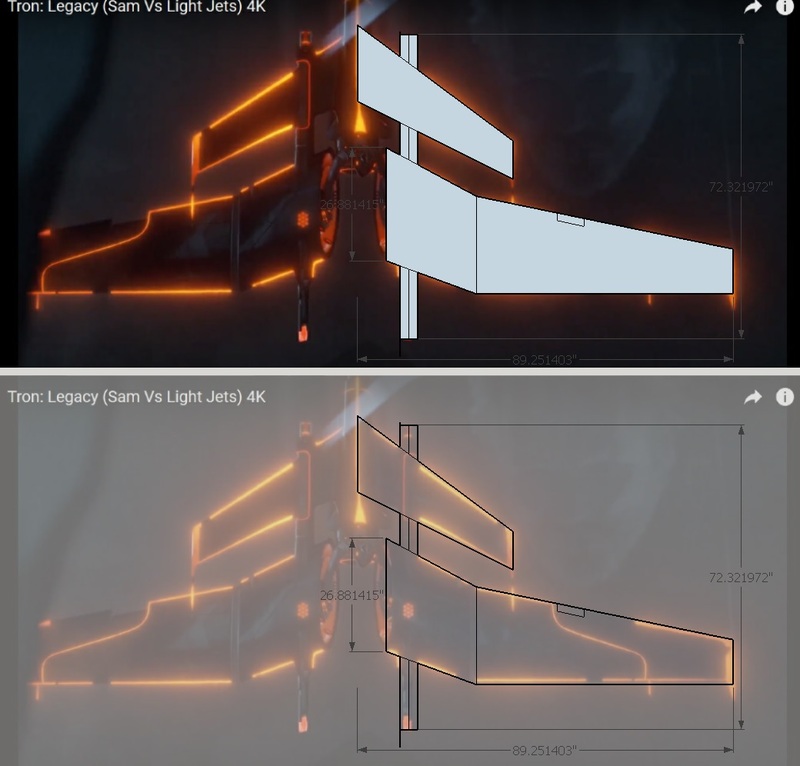 Online CG calculators put the balance point roughly where the two tapered leading edges intersect (ignore the actual lengths here, this is before the model was scaled appropriately). The plan was to use batteries placed in the pylons to help achieve this balance. 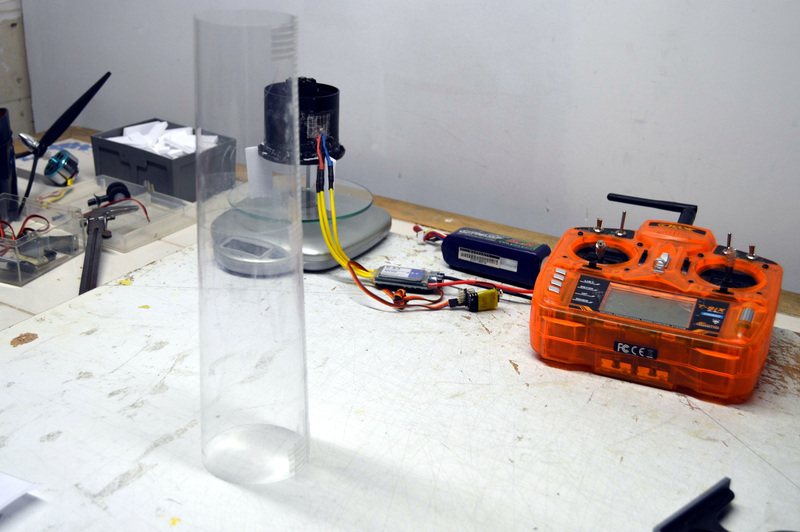 This means that the pylons need to be large enough in diameter to hold the battery. If I go 4S EDF approach, then the pylon will need to be ~2.8 inches in diameter to hold the 4S 2200mAh batteries that I have on hand. I can get away with smaller pylons if I drop the EDF and use a prop instead but this would have to be a "ducted prop" placed far forward in the fuse to avoid additional balance problems. 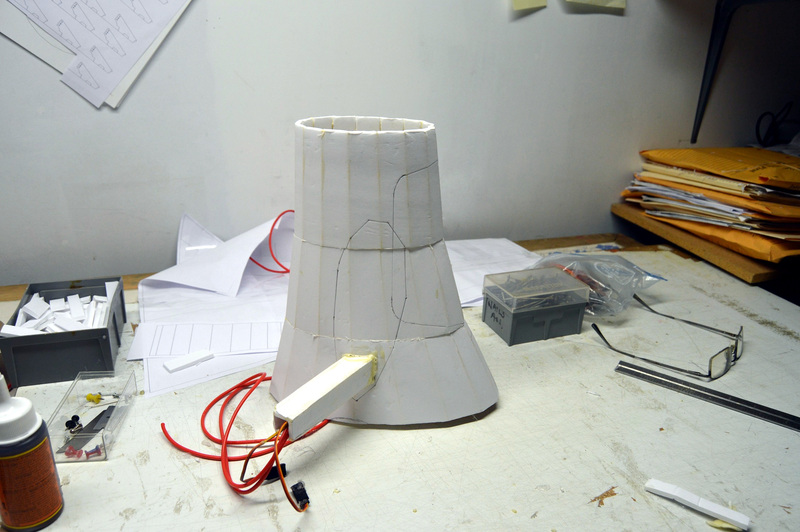 So if I scale the current model down to have a 2.8 inch pylon diameter, how big will it be? Well, the wingspan would be 116 inches! That's almost 10 feet - way bigger than I intend to build the model. 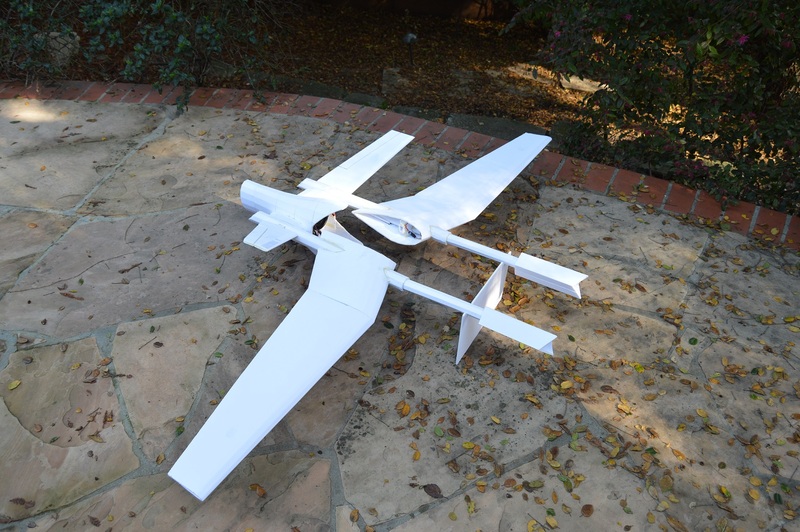 I was hoping to build at the 40 to 50 inch wingspan scale. Okay - plan B was to add extensions to the pylons that were larger in diameter to hold the batteries in the hope that this would not destroy the look of the plane. 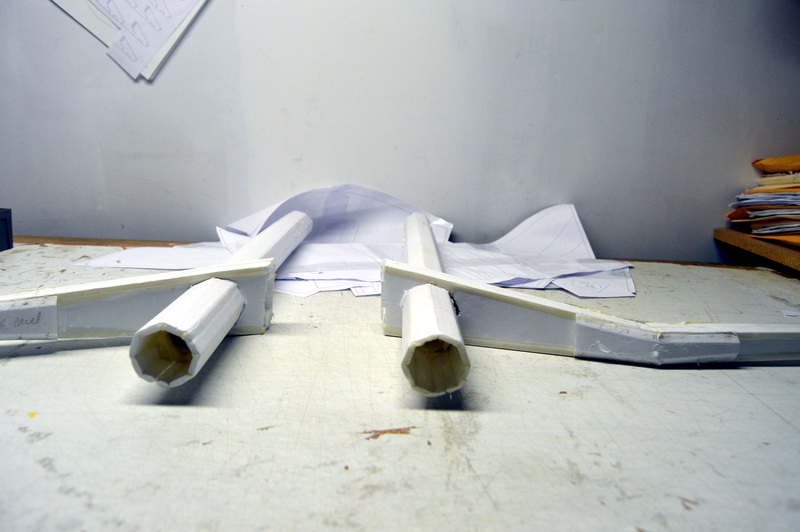 I put together two of these, a cylindrical one and a rectangular one which looks like some of the concept pictures. 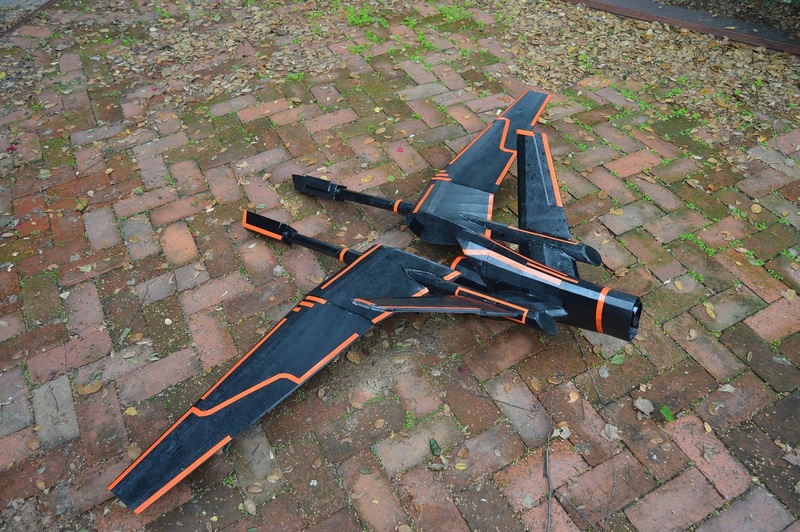 So how does a 40 inch wingspan version look with these extensions? Pretty bad. And it gets worse, because at this point I recognized that the fuse seemed narrow compared to the batteries - so would a 70mm EDF fit in there? Nope! 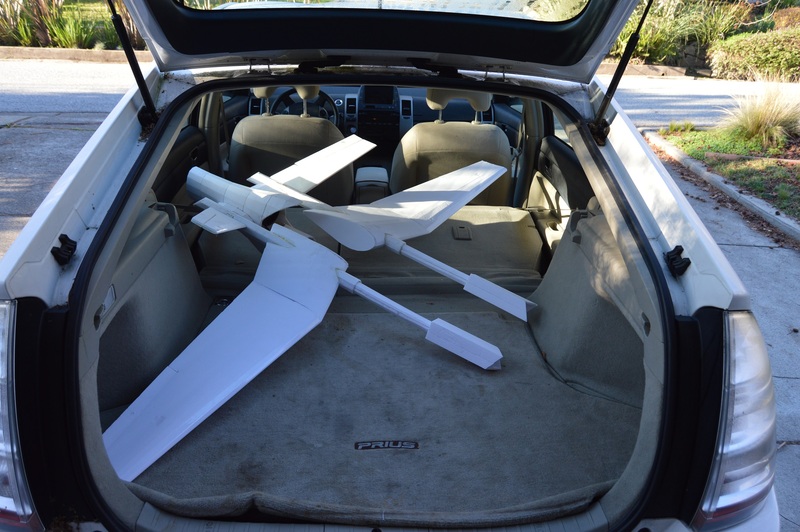 Eventually, after a number of rounds of scaling and squeezing components in, I figure that a 72 inch wingspan is doable, not so huge that it won't fit in my car (I think) and just about big enough to get everything in. But I will need to ponder this some more. 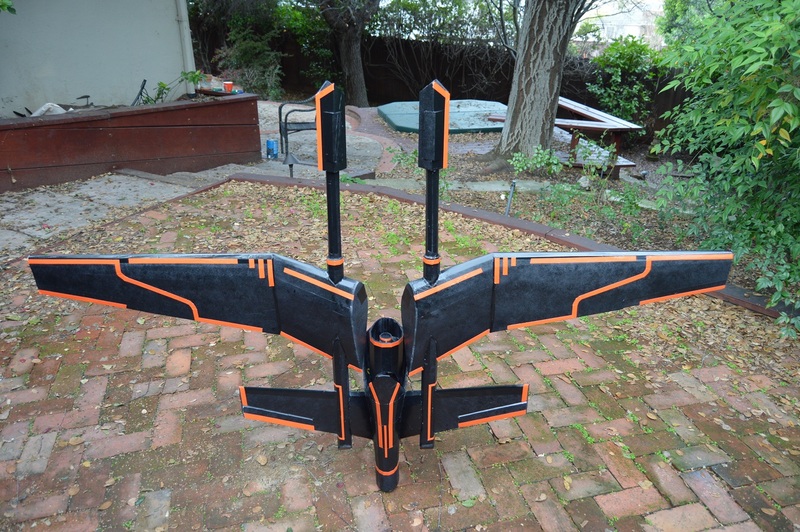 Okay - I think I will go with the 72-ish inch version (I might trim a little off the wings and widen the fuse slightly). 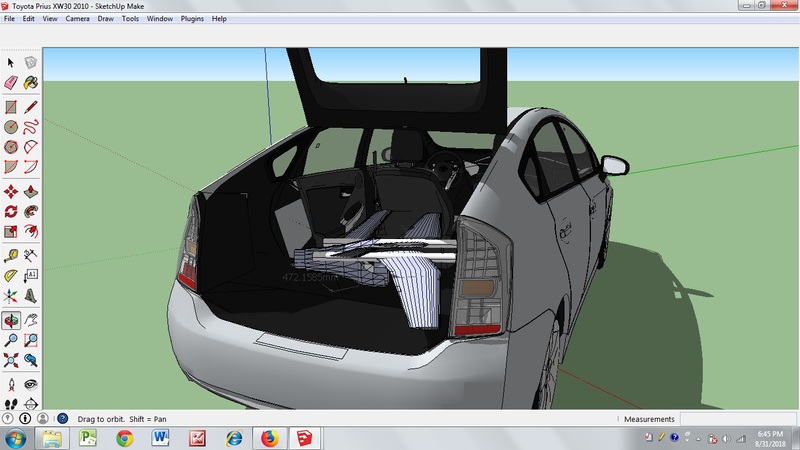 Rather than take my fat rump out to the Prius to confirm it would fit, I drew up a quick model of the Prius and checked the fit that way. (nope - I didn't draw this, I downloaded it from the Sketchup 3D Warehouse). After a little bit more tweaking and resizing I think I finally got everything to fit. 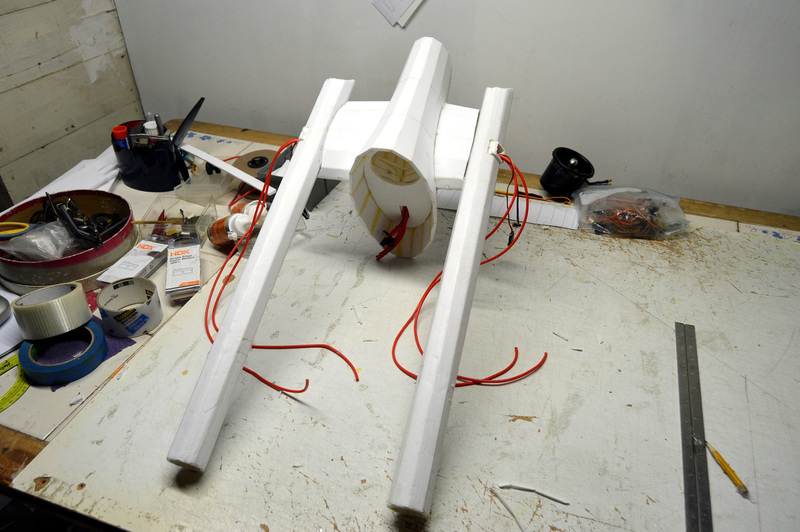 The fuse was scaled 5% larger and I reduced the angle of the v-tail so that the EDF could fit. From the pic you can see that the thrust tube for the EDF still interferes a little with the rear of the fuse but I think this will be okay. The battery pods don't look too bad at this scale and I think I will ultimately go with the rectangular prism version because they have a little more room. I would like to do something a little more "3D" for the rider on this model, but it will still be pretty simplistic as a fully 3D rider will hamper the EDF inlet. Tried to draw a profile based on the pics I have and then positioned this flat rider in the center of the model. ... and it fits reasonably well in the craft. Not going to spend any more time on this for now but I am going to have to fix the head so it looks less like a Star Wars battle droid. Man - last update on this was the beginning of September, need to get my bum in gear. Since September I have been thinking about how to put this together and also thinking about the scale, wingloading, weight etc. Right now I expect her to be in the 3.5 lb range which would put the wing loading (WCL) at around 15-ish. 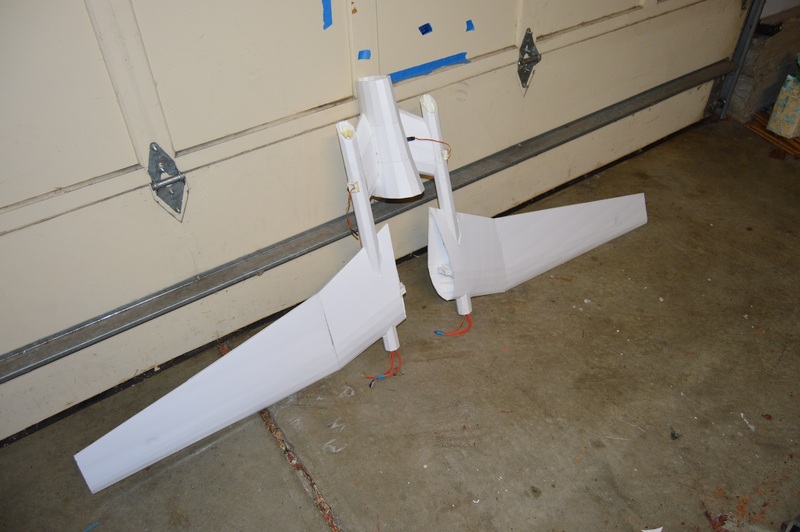 This is a worry because the scale only allows for one 70mm EDF from which I expect to get 2 - 2.5 pounds of thrust. To add to my worries, I have decided to see how far I can go without using any wood or carbon fiber reinforcement partly as an exercise in frustration and partly to keep the weight down. Did a little work on the pylon mount. Essentially it will be a two component deal - an DTFB square section spar and the shroud that connects the pylon to the fuse. When I looked closely at the some of the pictures, the piece between the fuse and the pylon is a lot beefier than I had originally thought so I took advantage of that. This pic shows how the pieces come together. 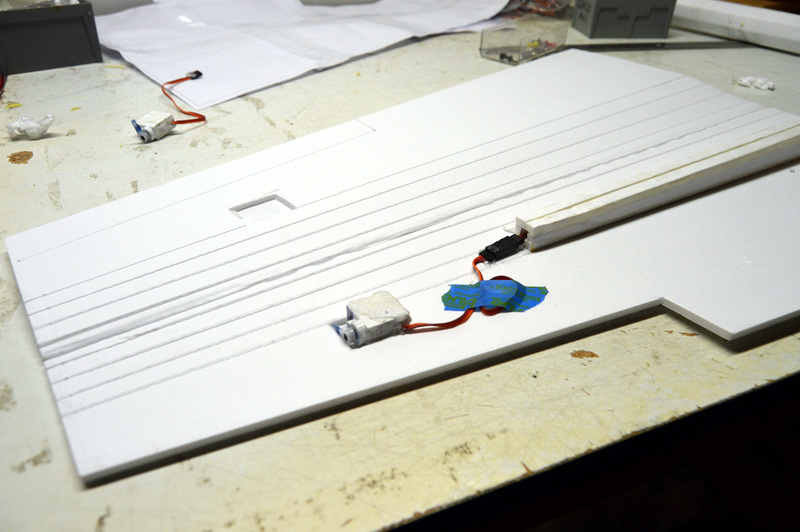 The spar will be joined to the spar on the other side at the base of the fuse where the two will be braced with some foamboard. 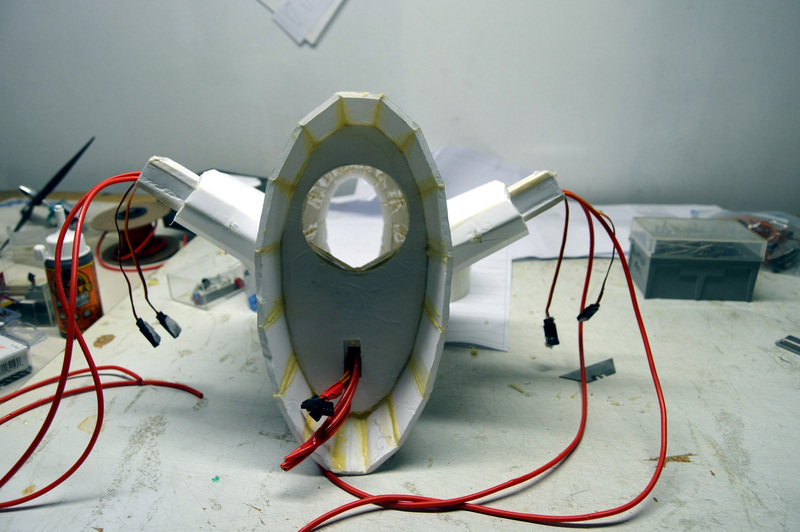 This bracing piece might fill the whole fuse cross section so I can use it as a mounting plate for the EDF also. 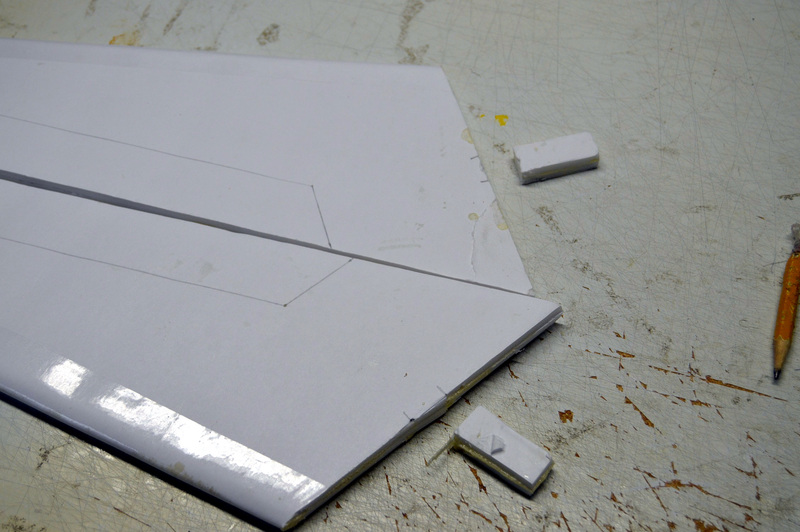 Now that I am not going to use some sort of airfoil for the V-tail, I replaced it with a simple flat panel which I imagine will be a double layer of foamboard. While I was working on the pylon I also shortened the main pylon and added really long extensions which will hold the battery pods. Hopefully these are way too long but I thought it best to build them this way until I can confirm that I can balance the plane properly. Because these extensions will slide into the main pylon, it will be easy to progressively shorten them until they are the correct length, at which point I will glue them in. 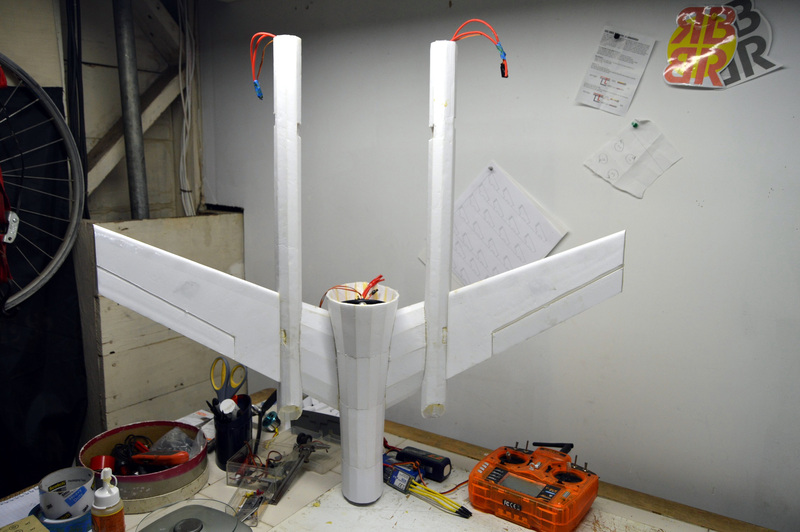 Next up I will need to work on the wing and how it will mount to the pylon. 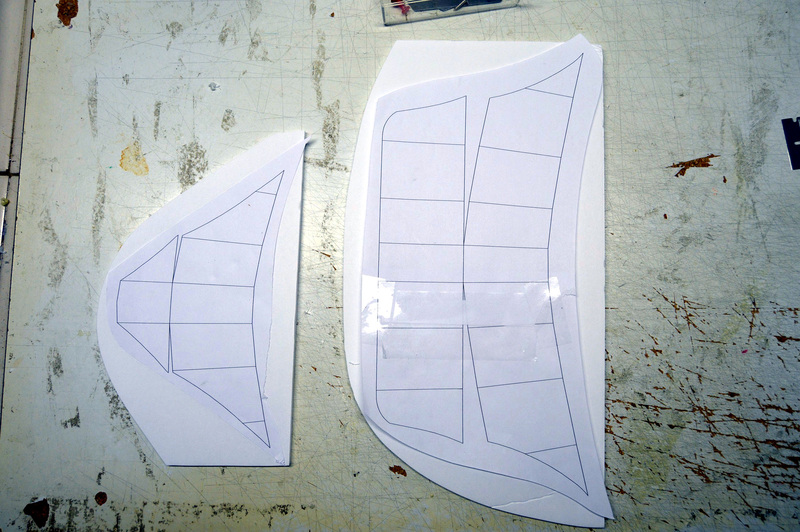 Started to try to design the wing. First decision is whether the wing "goes through" the pylon or whether the pylon goes through the wing. From some of the images I have it seems that the pylon is completely enclosed by the wing. 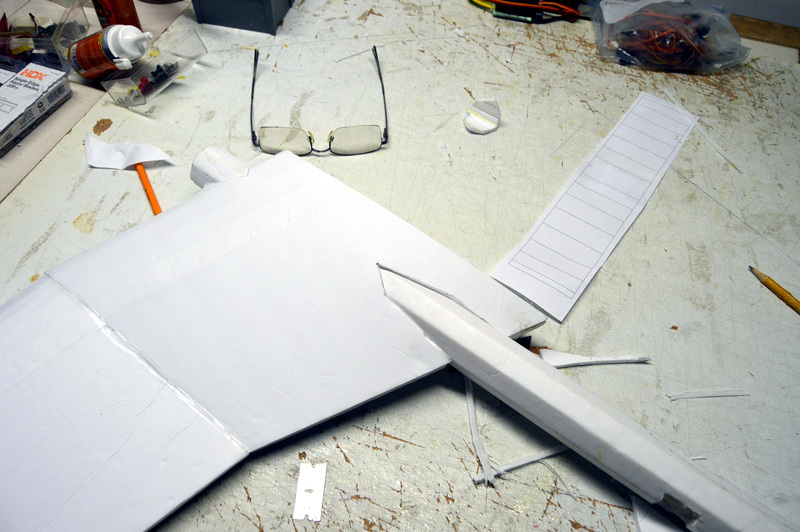 I like this in concept because the thicker wing root could be stronger and I might have more surface area for gluing. Additional spars could be shoved through the pylon from the inboard side to provide additional strength / support. I used a plugin that I have developed for making wings in Sketchup. 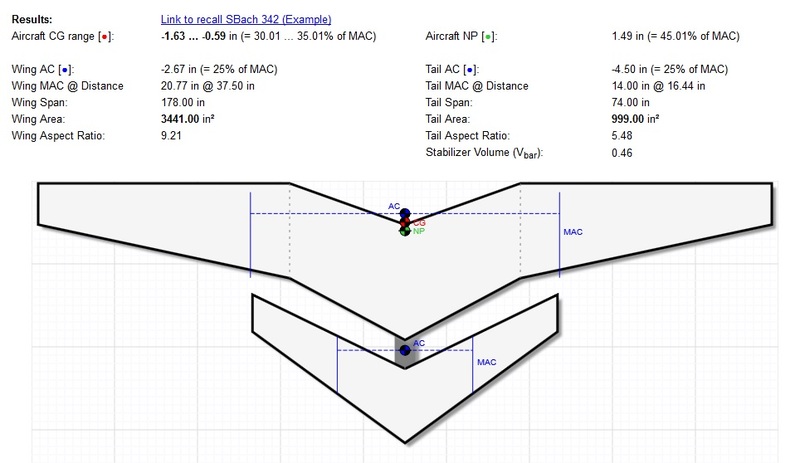 You provide a file containing the airfoil coordinates and then you can define four different sections including chord, percentage thickness, taper, and dihedral for each section. 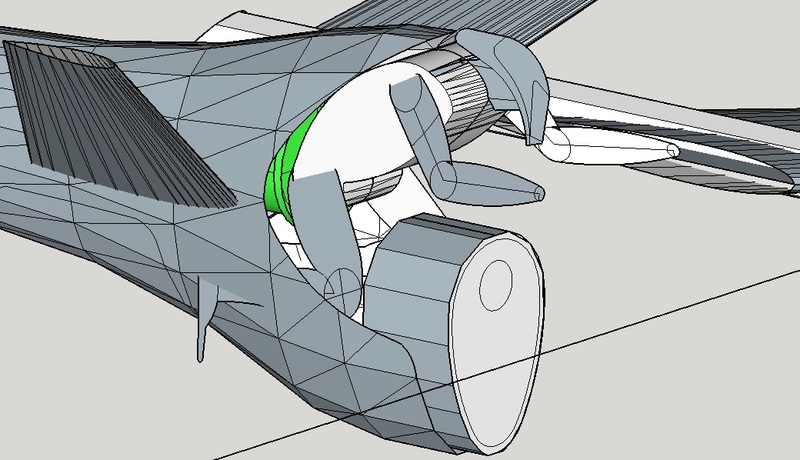 The plugin then models a wing half in 3D and also unfolds the sections. 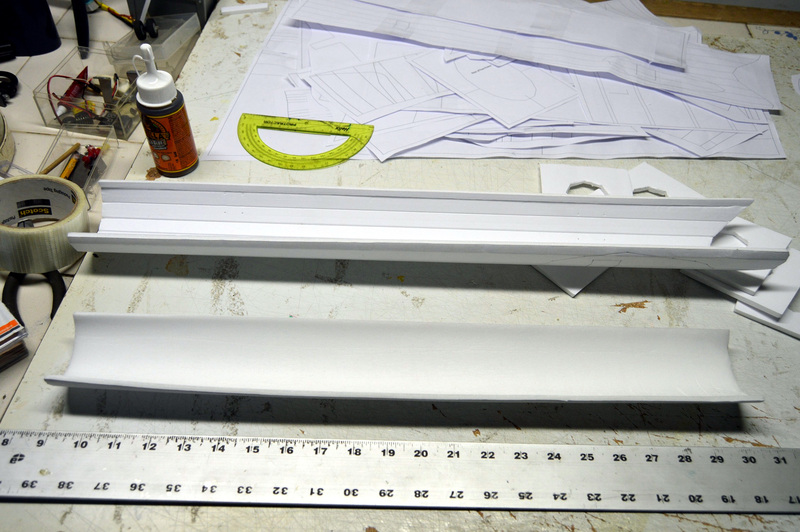 Here is the wing produced for the light jet using a NACA0010 profile. 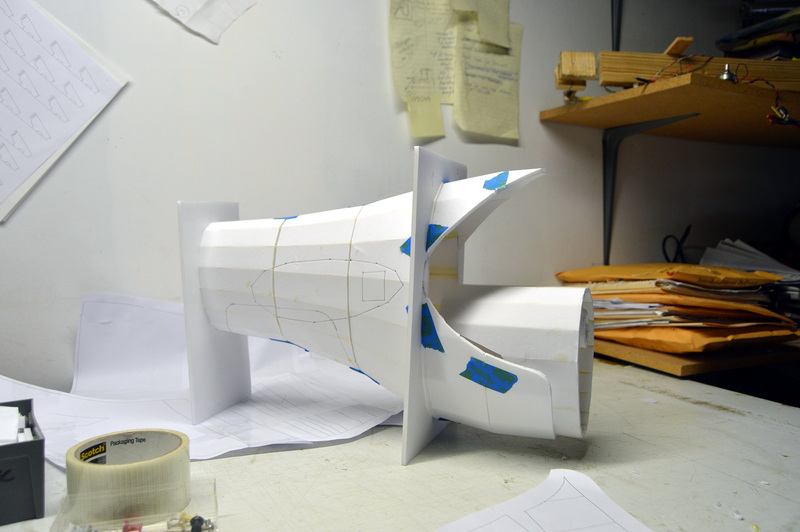 And this is the same model with a 200% thickness (which ends up being 20% because I am using the NACA0010 airfoil). 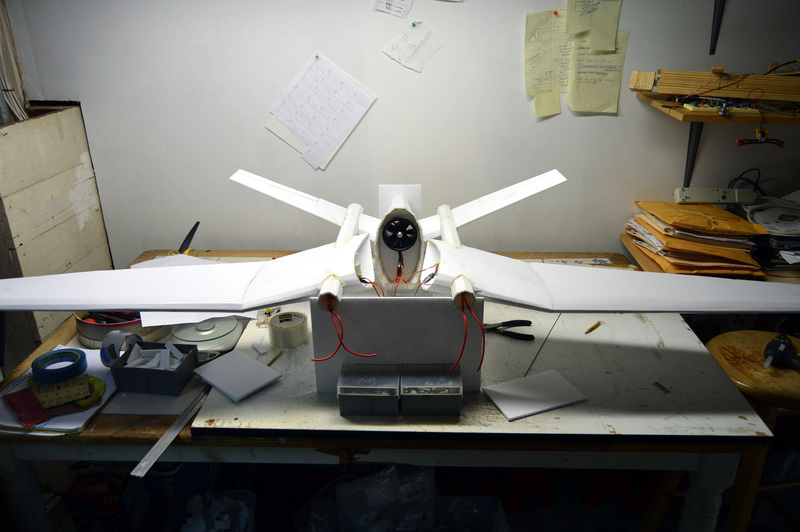 Eventually settled on a wing thickness and modified the airfoil to be a little simpler but symmetrical, kinda like the FT Edge wing. 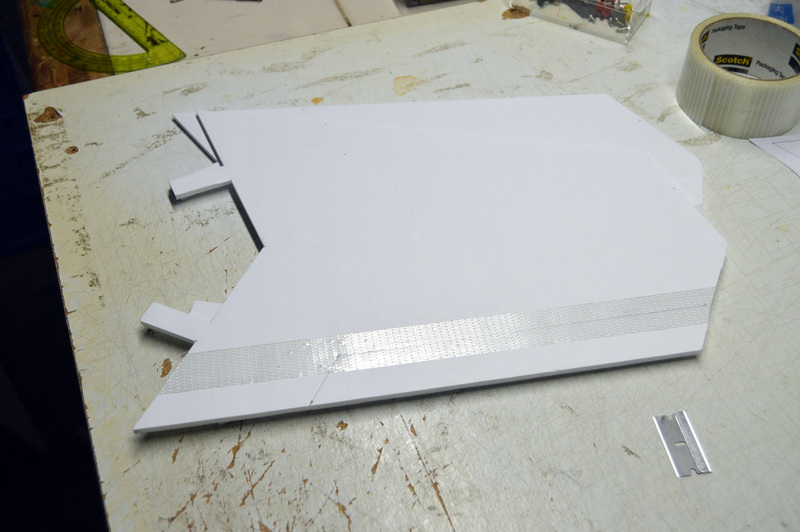 Modeled a box spar for the wing taking the foamboard thickness into consideration. 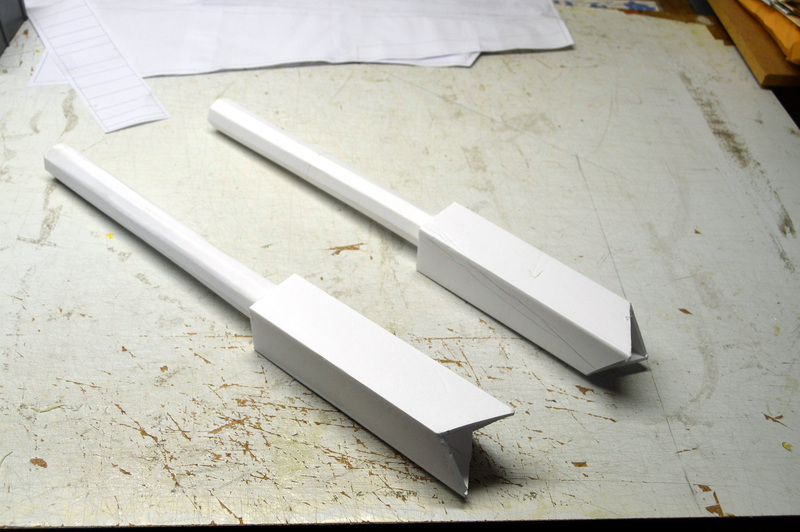 The spar is modeled all the way to the tip but I will shorten this to about 50 - 75% of the outer wing panel to save weight. I like the way the pylon will go through the spar but its gonna be a tight fit, which is probably not a bad thing. 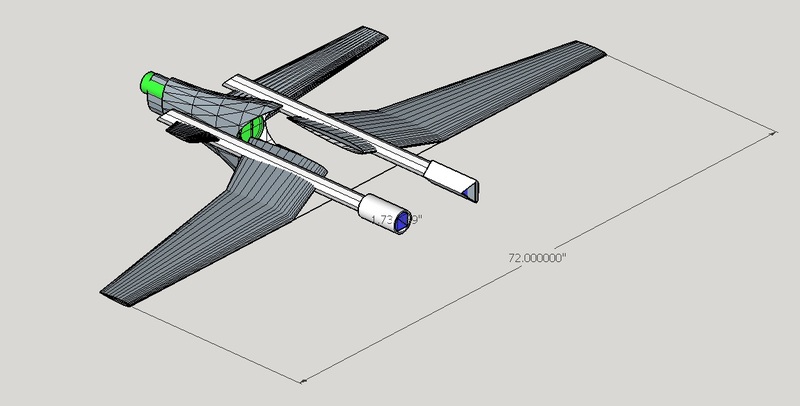 Then modeled a second spar which will "pin" the wing to the pylon. Getting close to generating a first draft set of plans. Just a couple of small parts to add to the Sketchup model and and I should be ready to start unfolding the 3D parts to plans. Added an upright post to provide additional strength to the spars that will support the pylons. Also modified the "seat" part to extend further into the fuse. 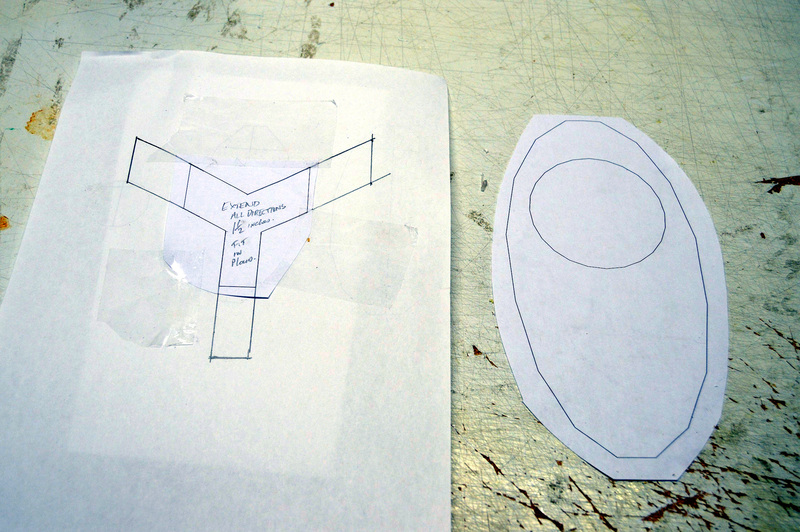 As drawn it will interfere with the EDF inlet, soI will remove some of the foamboard when it is installed. Also decided to make the circular feature in the front of the seat section its own part which will be suspended from the roof of the seat part. Tidied up the rest of the 3D model to the point where I was happy that I had covered most of the stuff needed to create a set of plans. Unfolded the pieces (I was a little shocked at how many there are). 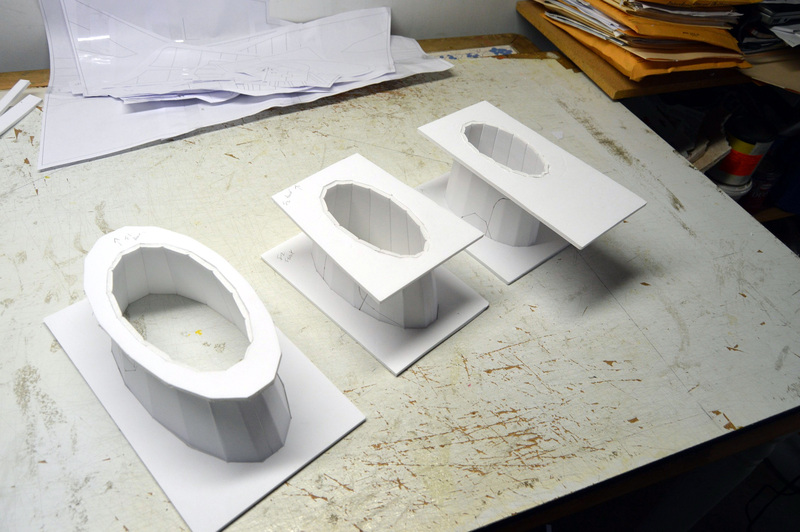 These will be converted to a DXF file and assembled for printing in DoubleCAD XT. Should start building real soon. The model is sitting, complete, on the bench. Just needs a paint job. Given that I am unlikely to rebuild if it fails miserably on maiden, I should probably document the build before I lose the motivation to do so. Warning - lots of pics and foamboard abuse ahead. 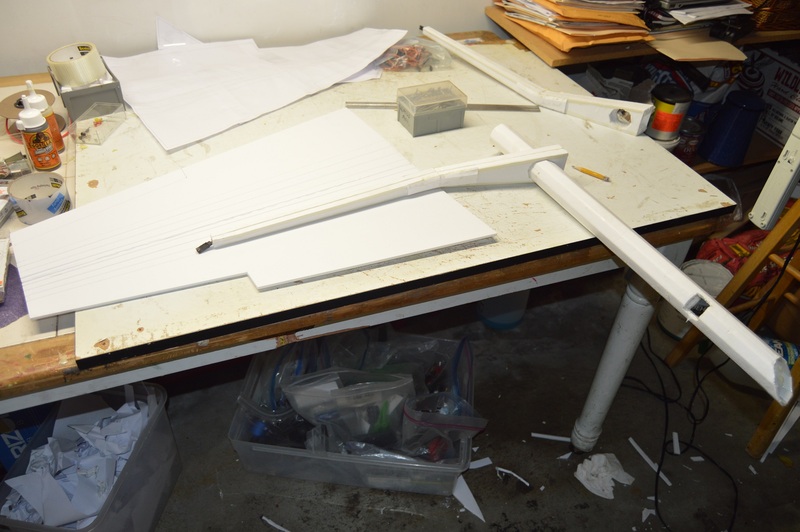 Also note that I set an additional "rule" for myself to only use foamboard and glue and not use any wood, metal, or carbon fiber reinforcement. You will see that I didn't quite manage this - but I got pretty close. I was surprised that the initial plan version was 60 pages! 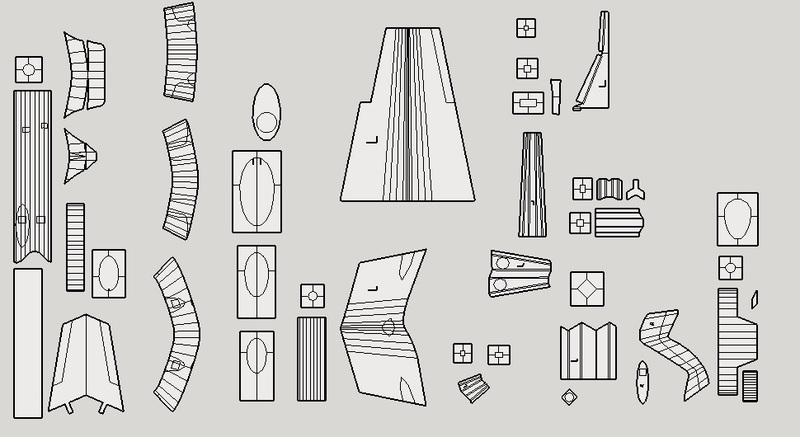 And this was a "one-sided" plan - that is, I only printed one side of every part that is mirrored either side of the plane (wings, pylons, battery pods, half a v-tail etc). 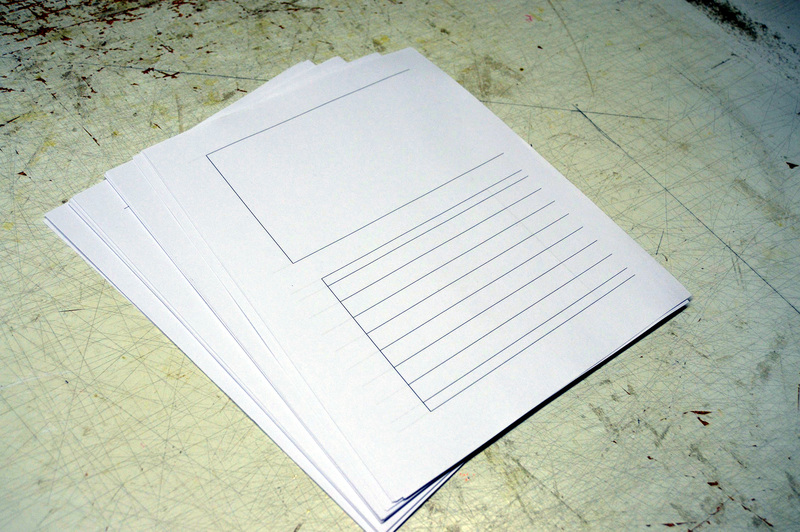 Joined the pages to make each part template. 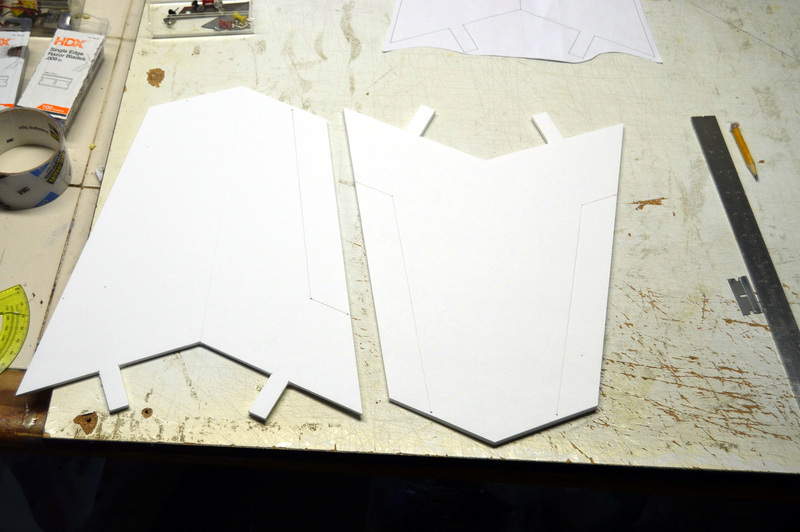 I had not cut any foamboard for a couple of weeks so I started with something simple (and not particularly important). Usual cut the part / score cut the part / add gorilla glue to the score cuts / fold and hot glue the seam / frame the part. The pylons proved to be quite challenging. 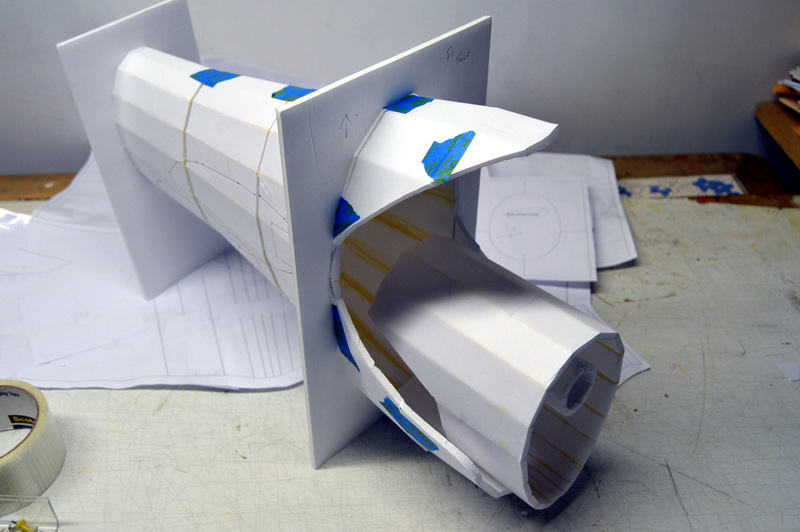 The part itself is pretty straightforward but I thought I would add an inner sleeve of foamboard with the hope that would increase the torsional strength and overall rigidity of the part. Cut according to the plan and transfer certain features through the plan to the other side (e.g. hole for the pylon supports and alignment marks for the wing pins). 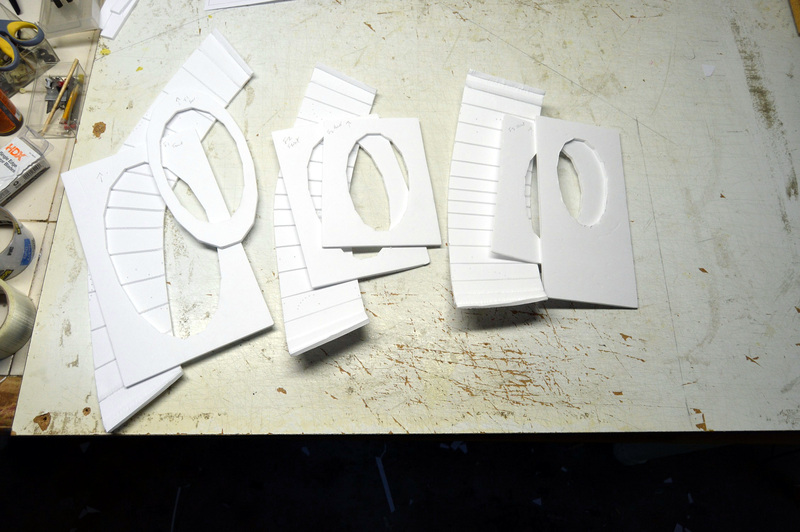 These additional holes are not cut out until the part is fully dried. The part is dry fit in its frames prior to gluing. For the first pylon the goal was to glue, assemble and frame the outer layer, then glue the inner sleeve and slide it into the pylon. This did not work very well. Take a gourmet sausage, cover it with oil, and try to shove it into a 1/2 inch pipe - then you will understand how hard this ended up being. Ultimately I got about 1/2 of the sleeve into the pylon. I ended up cutting off the remaining half and shoving it in the other end which kinda worked but the pylon had a slight twist in it so I placed a weight across the frames to try to make sure the part dried straight. For the second pylon I pre-rolled and taped the inner sleeve and inserted it into the pylon before folding the outer part. This worked a little better. Overall, the pylons came out well enough and ultimately did the job however, I think there are improvements that could be made here and ideally I would test multiple options (including no inner sleeve) to see which is best. Three sections in the middle of the fuse were constructed first as they were key to assembling the supports needed for the pylons. The pylons are supported by an internal "Y" frame which protrudes through the fuse and into the pylon. They are also supported by the outer fuse skin using a ring that snugly sits between the fuse and the pylon. Lastly, the EDF holder (which is basically a plate) will be glued to the "Y" frame and the fuse to impart some additional stiffness to the pylon support. 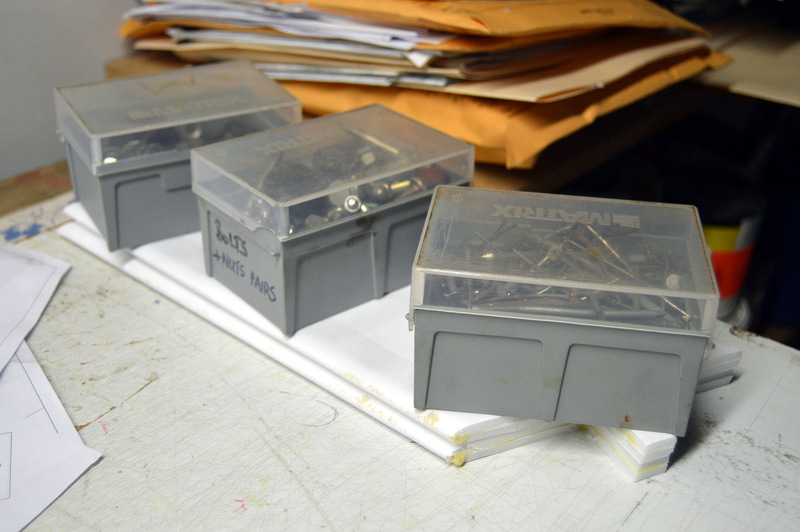 ... the parts for the Y-frame, two box section pieces that go through the fuse side wall and an upright post. ...and the EDF holder and additional Y-frame reinforcement piece which is glued to the back of the Y-frame. 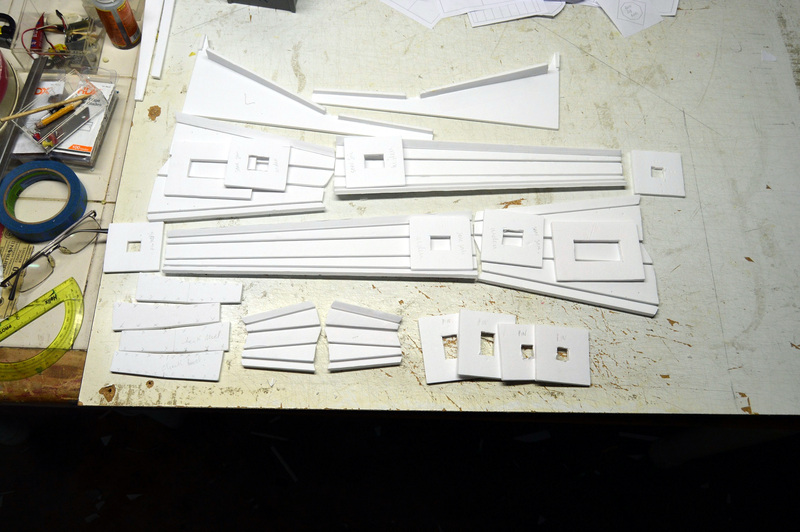 The parts were gorilla glued and assembled into frames. The additional leaves for the front of the fuse were cut and dry fit, just to see how the final fuse would look. The seat part was dry fit also. Early in the build I had to think about wire management and the servo extensions and battery wires that needed to be pre-installed inside the Y-frame. Small reliefs were cut from the Y-frame parts to allow the wires pass through the Y-frame parts and EDF holder plate, emerging toward the front of the fuse. 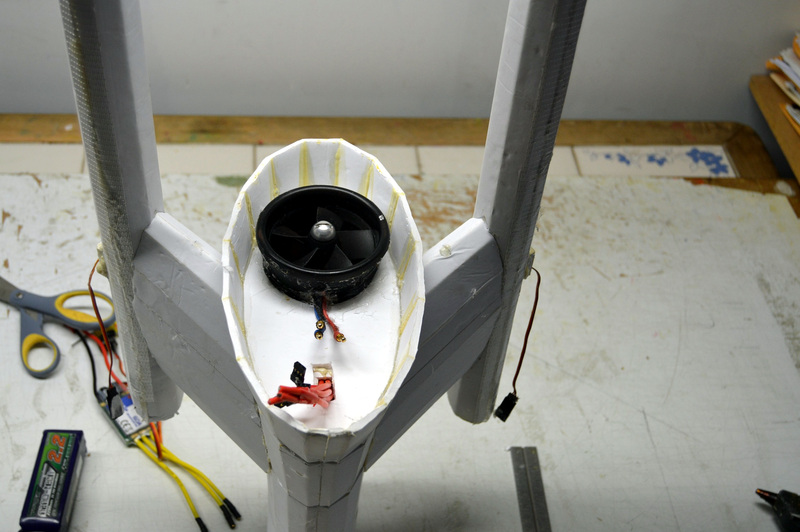 The battery wires were measured against the dry fit pylon and were cut just long enough to exit the front of the pylon. These would need to be extended once I figured out how far forward the battery pods needed to be. 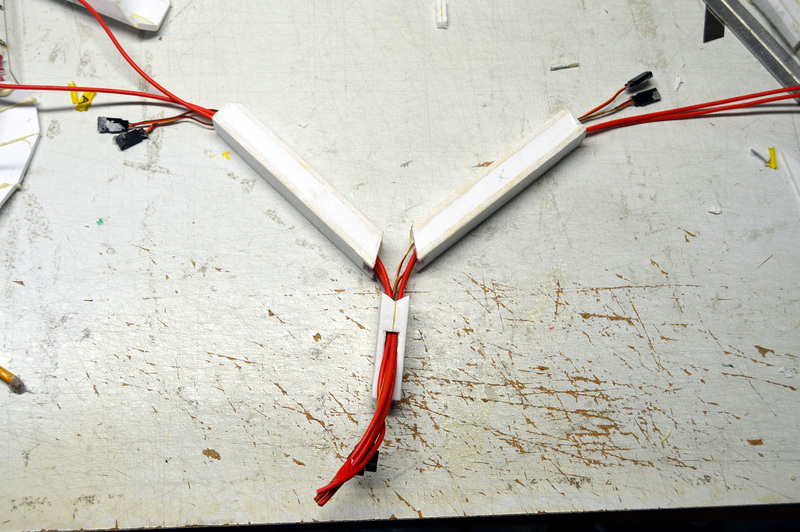 The wires were installed into each side of the Y-frame pieces which need to be installed from the outside of the fuse and glued together on the inside of the fuse. Need to be careful not to hit 88mph with this thing. 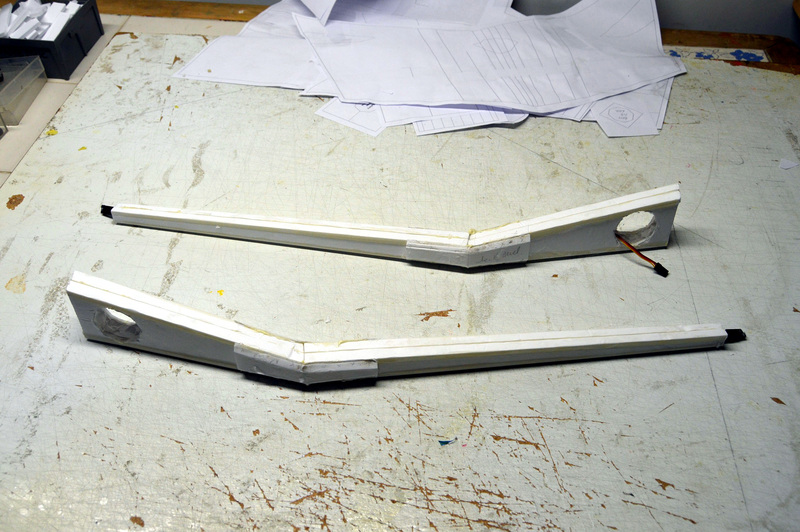 Once the Y-frame was installed in the front fuse section, the EDF holder and Y-reinforcement plate were glued in. 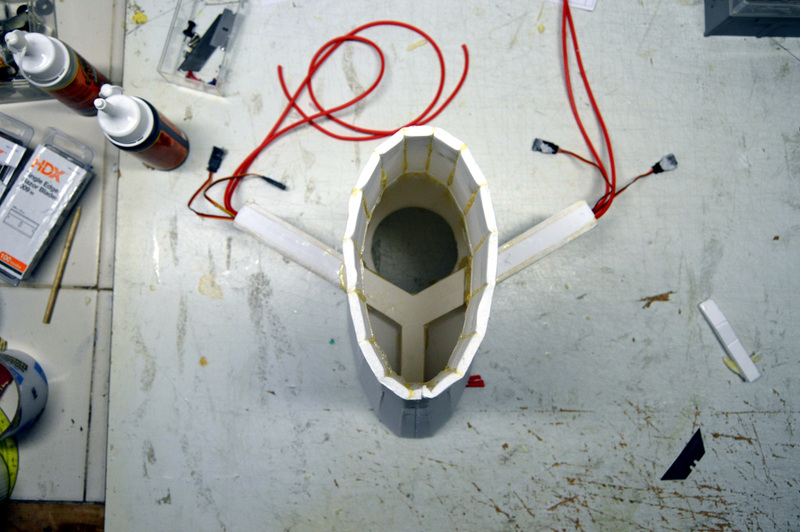 Then the remaining rear sections of the fuse were glued on and the side pylon supports were added. 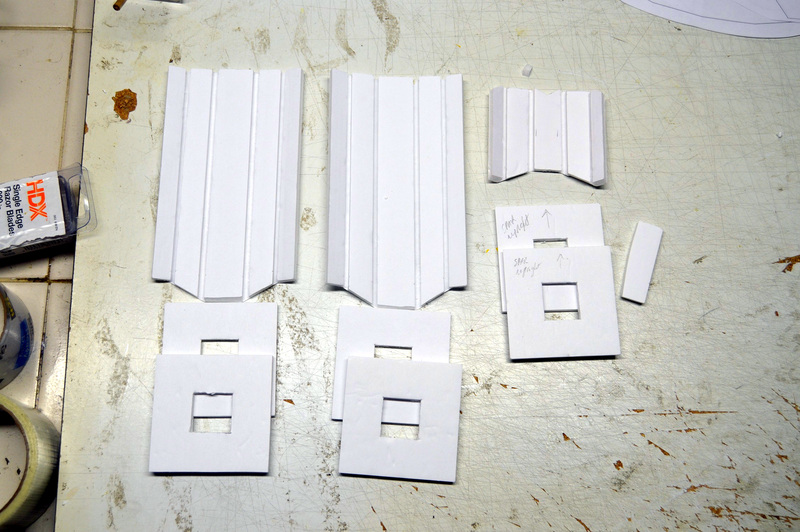 These side supports needed to be beveled to make sure that they fit flush on the side of the fuse. 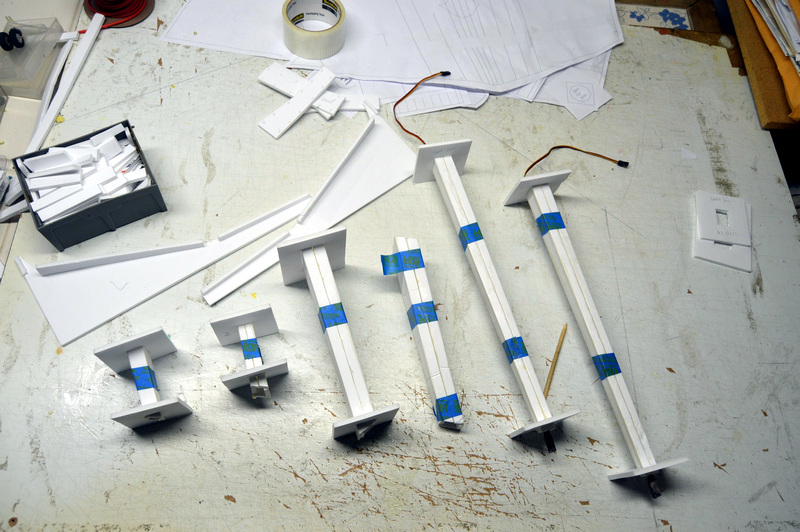 Before mounting the pylons to the fuse, I wanted to build out the wing spars and wings so that I could check that they would mount onto the pylons correctly. 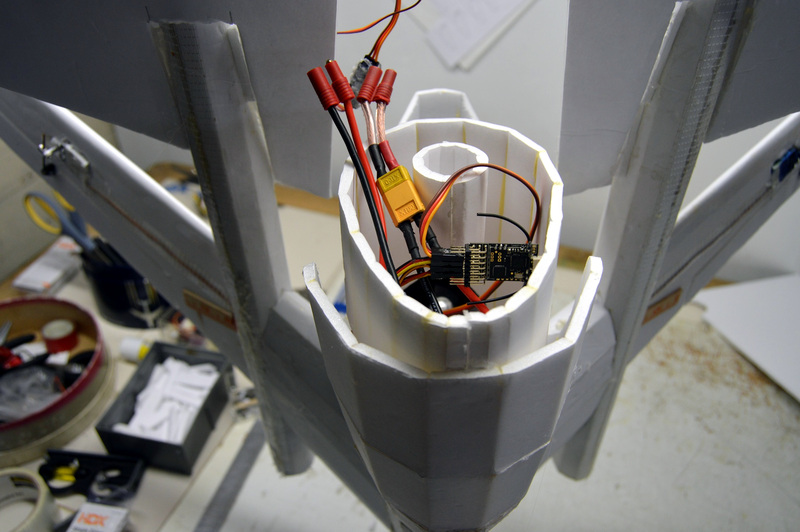 I didn't want to be messing around with test fitting the wings onto the pylons while attached to the fuse. The wings are a little tricky. The root section is very thick, with the leading edge tapering forward and a negative dihedral (anhedral). This is then joined to the main wing which is level. The sections are symmetrical. The spars are boxed sections using b-folds. 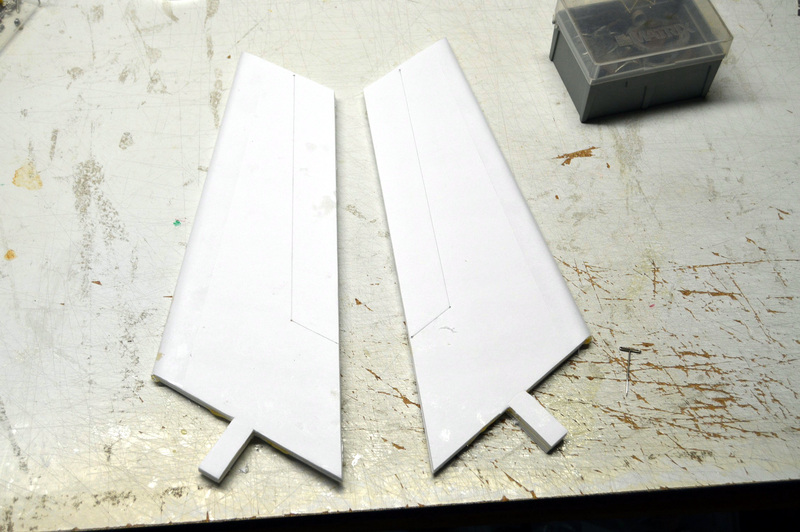 There are two spar parts for each wing half. 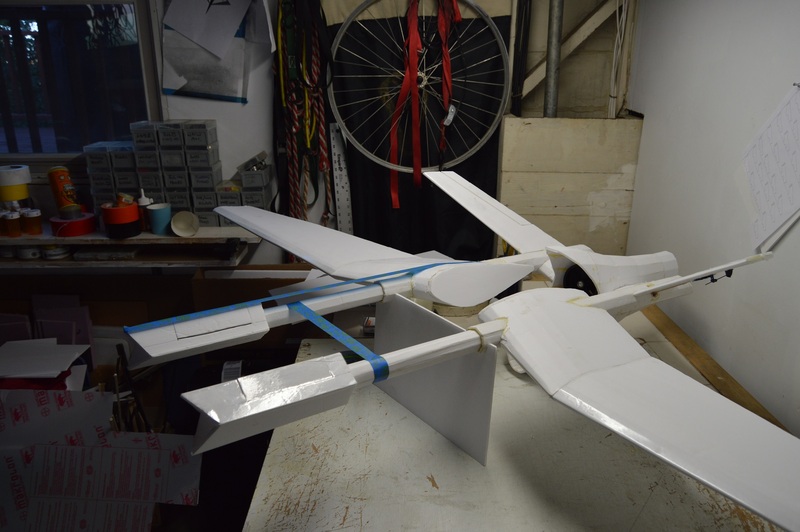 The additional small parts are locking pins that will push through the spar and pylon together, locking the wing in place. 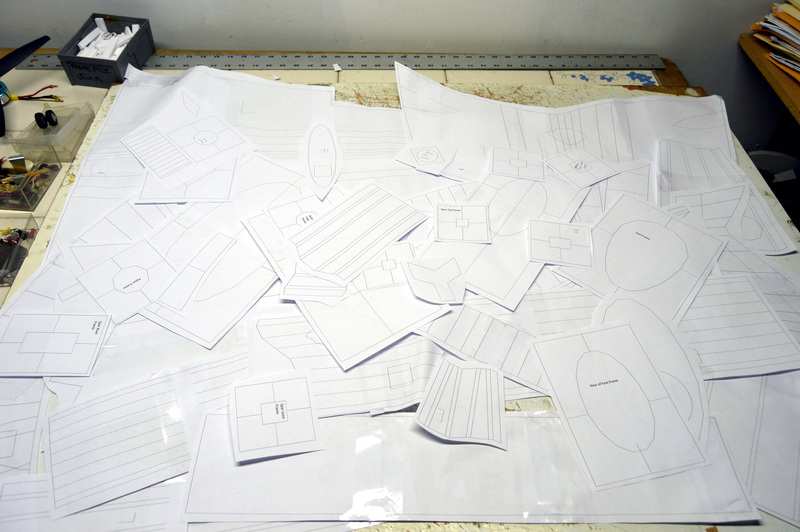 The parts were cut glued and framed. 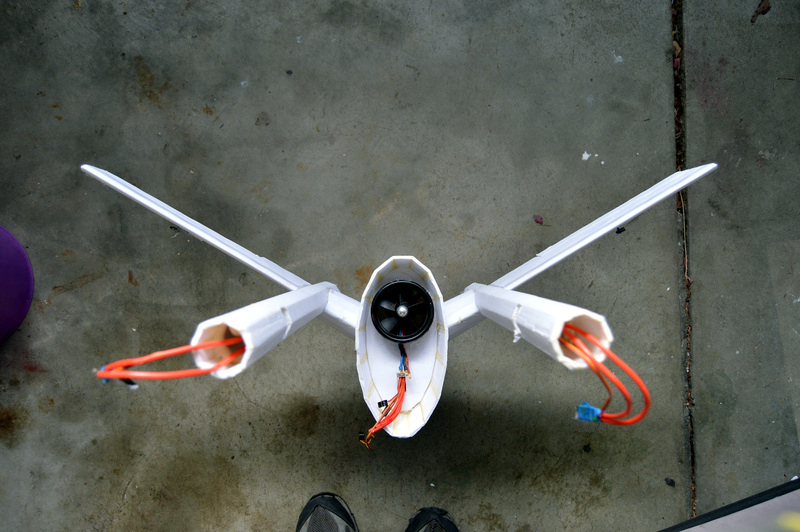 Servo extensions for the ailerons were pre-installed so that they ran through the spar. In hindsight I think this was a mistake as it made final installation of the wing onto the pylon really difficult in terms of wire management. 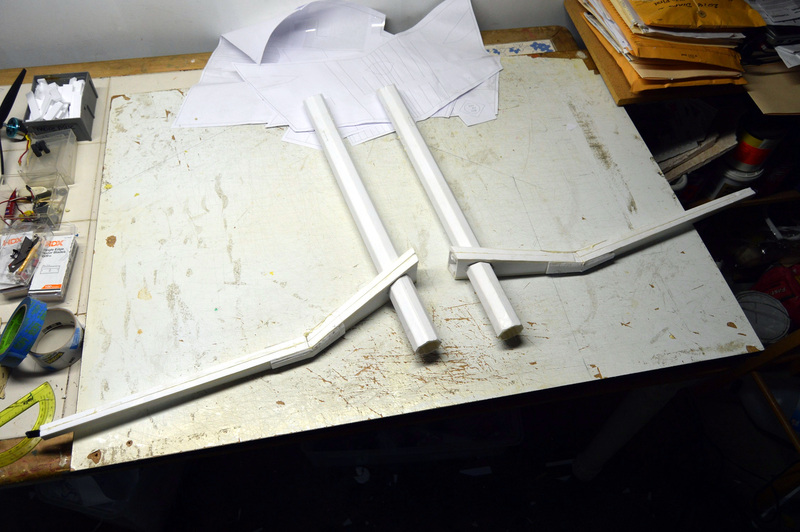 I made small jigs that would correctly set the angle of the root and main spars when they were glued. These seemed to work well. However, when time came to add the root section to the main section of the wing there was a slight misalignment of the spar on each wing. The pylons will run through the center of the root spar so the appropriate hole was cut and the part was dry fit onto the pylon. 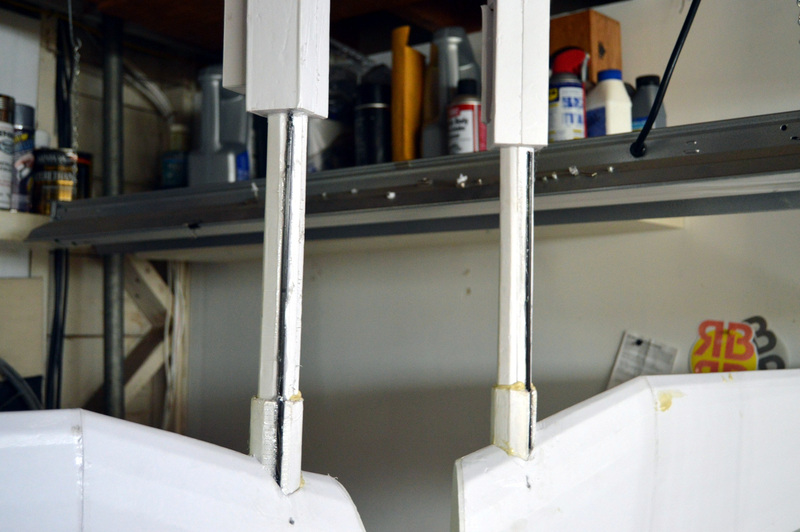 Small flat plates were cut and glued to the front and rear of the spar to provide additional strength to the joint. These were gorilla glued so the parts were wrapped in painters tape while the set. 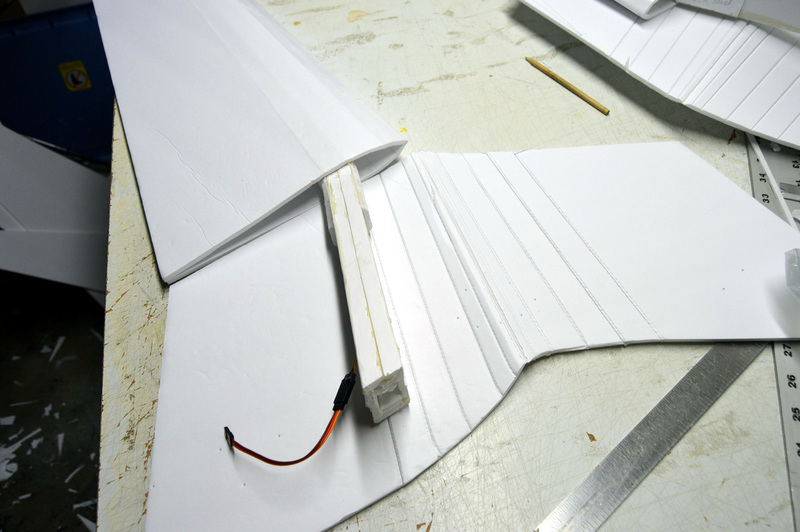 Each wing half is constructed using the foamboard spar described above and two symmetrical airfoil sections. 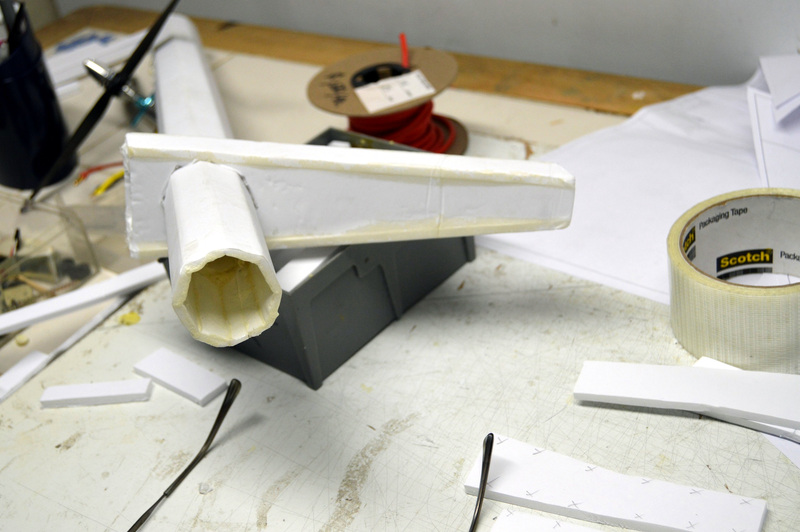 The outboard section of the wing was prepped first by hot-gluing the spar into place and pocketing and installing the aileron servo. 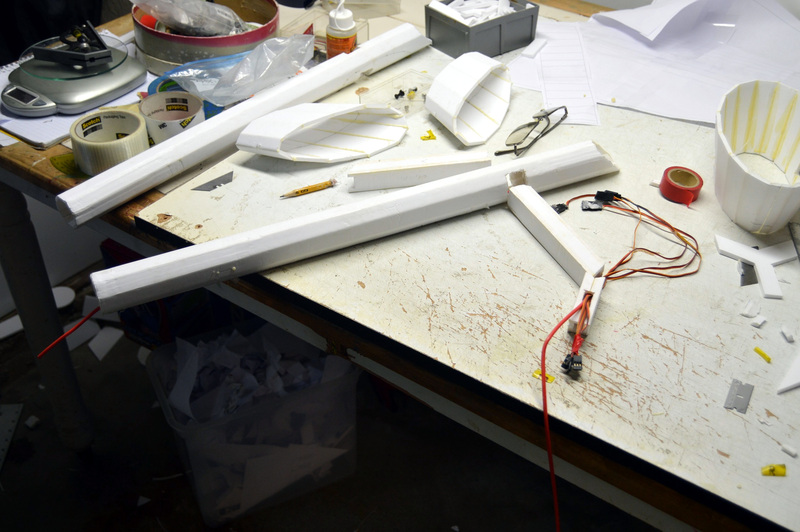 A pylon was again test fit into the spar to ensure that the wing panel and pylon were square. The wing was folded in three stages. 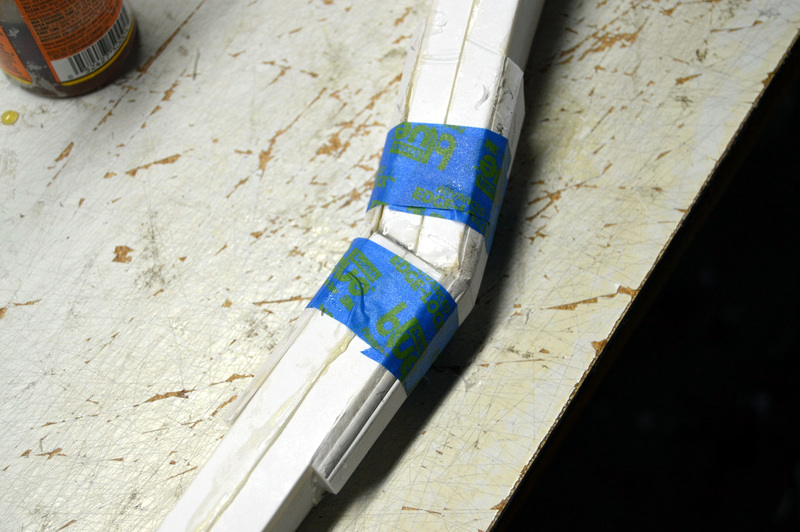 First the LE was folded and glued to the spar. 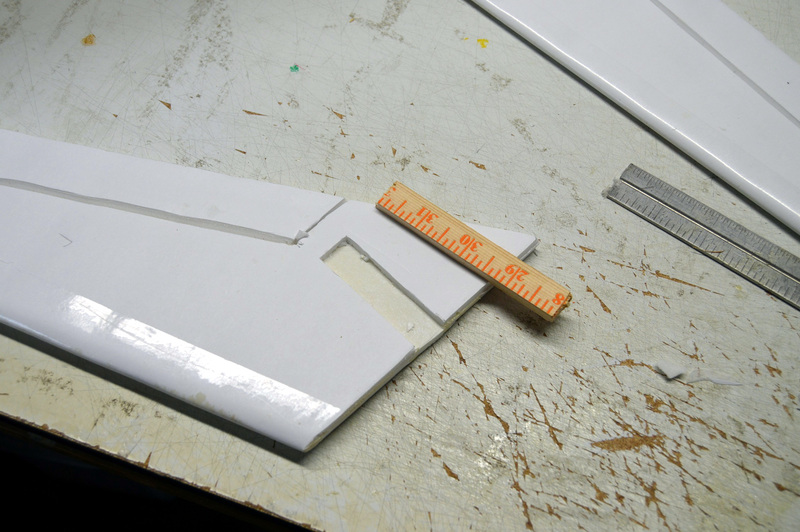 Then the TE from the root to the start of the aileron was glued. 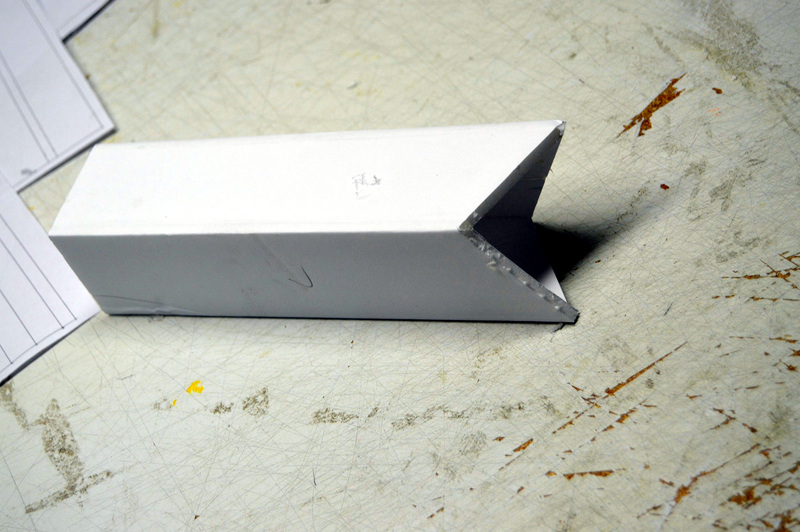 Lastly, the outboard TE for the aileron was glued with the wing upside down on the bench to provide a slight downward twist to the tip (to provide some washout). 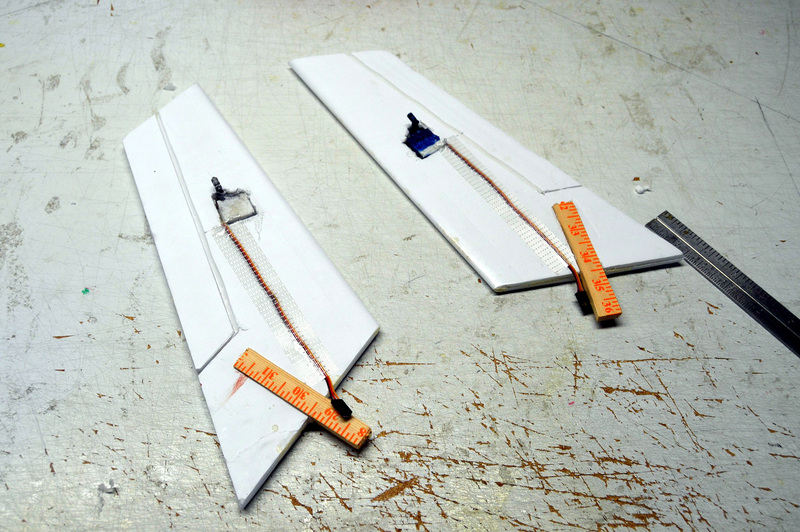 The root sections of each wing half were installed by folding onto the spar. 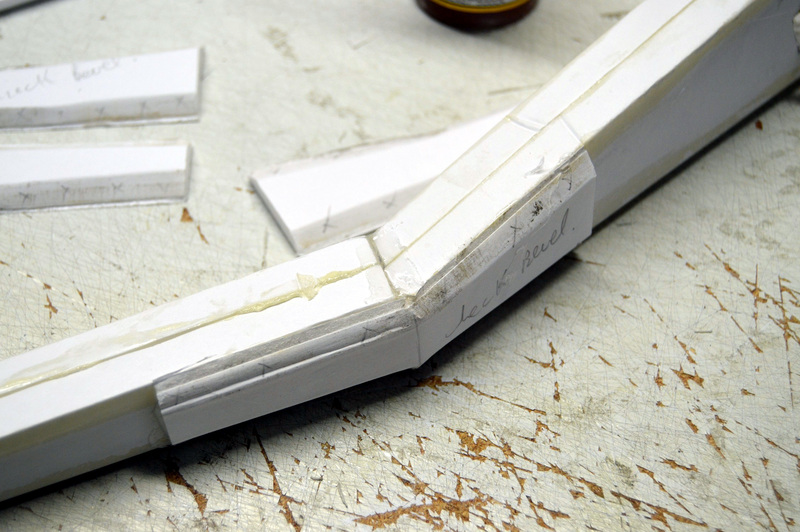 The flat underside of the wing surface was glued to the spar and then the wing was folded over so the the upper surface could also be glued to the spar. The TE was glued last. Once the root sections were set, the reliefs for the pylon were cut. Unfortunately, although the reliefs were marked correctly for a pylon interfaced with the wing, the cutouts did not actually let the pylon be installed. So the bottom relief needed to be expanded slightly and cut as a rectangle so the the pylon could be pushed up into the wing, then forward through the hole in the spar. Once it was confirmed that the pylons would fit, it was time to mount them to the fuselage. The pylons were dry fit a number of times to make sure that there was good contact with the support frame and side supports. 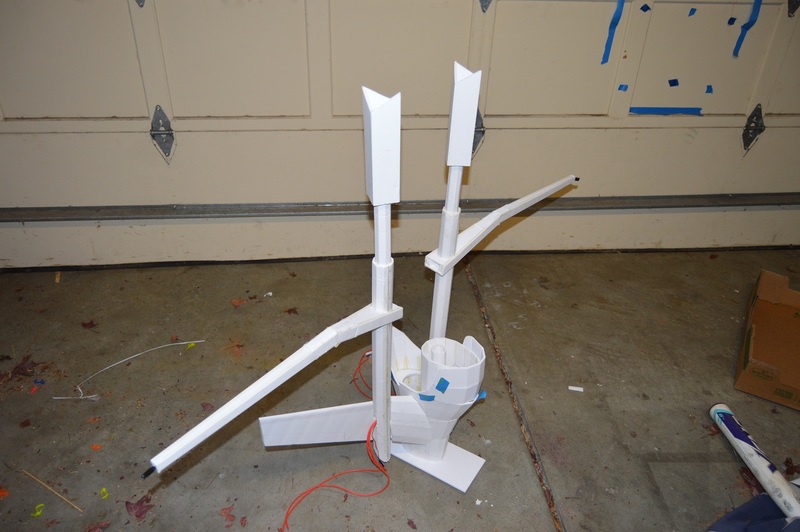 Once happy with the fit, both pylons were gorilla glued at the same time to the Y- frame and side supports. 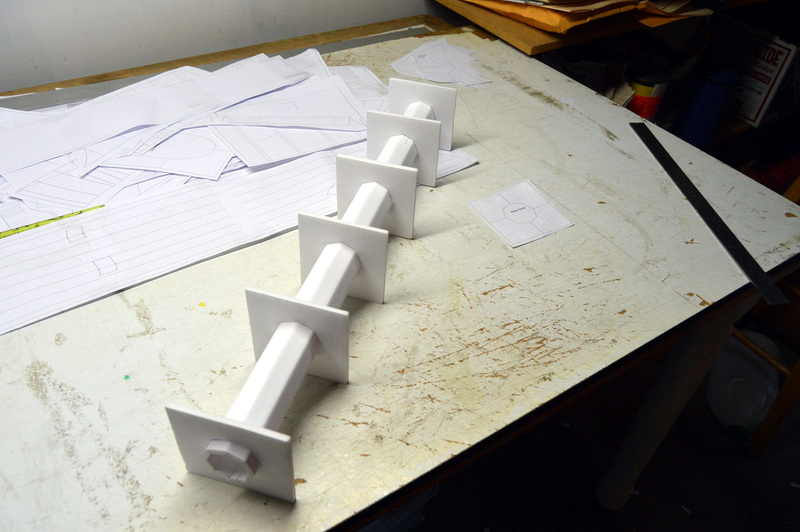 A support piece was prepared that would hold the pylons level and square with the fuse while the glue set. The wings were dry fit onto the pylons just to get a look at how the shape was developing. The thrust tube was pretty standard fare. I use old overhead acetates for making these because its reasonably light, and bends very nicely. The part was rolled, taped, and affixed to the EDF with extreme packing tape. The exhaust diameter was 2.3 inches to give 90 - 95% FSA. The EDF was then glued into place. 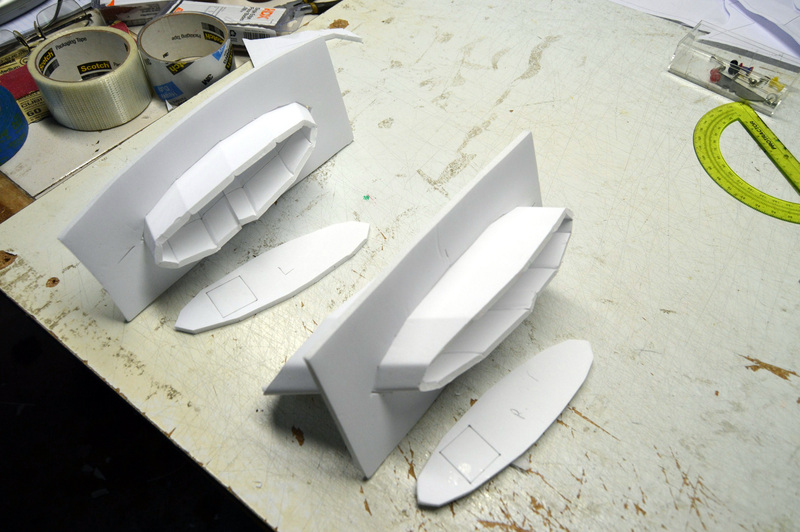 The V-tails are double thickness foam, folded along a leading edge and gorilla glued together as a laminate. 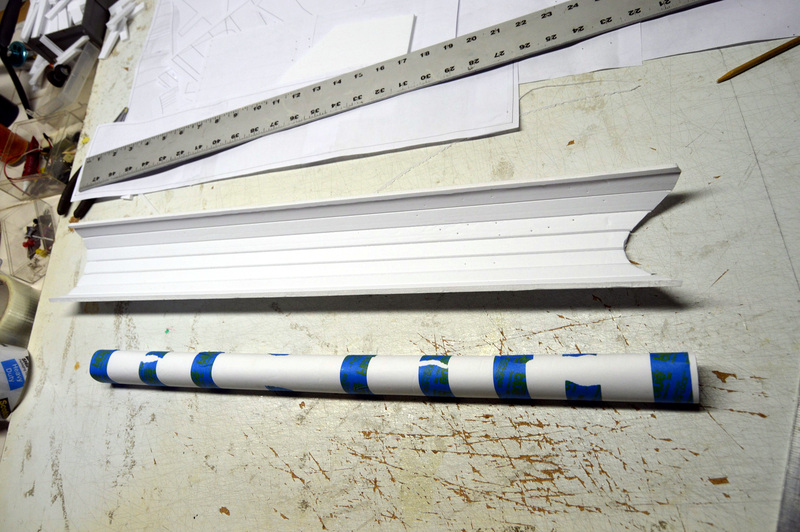 The strip of extreme packing tape laid along the control surface hinge inside the part was to form the hinge. 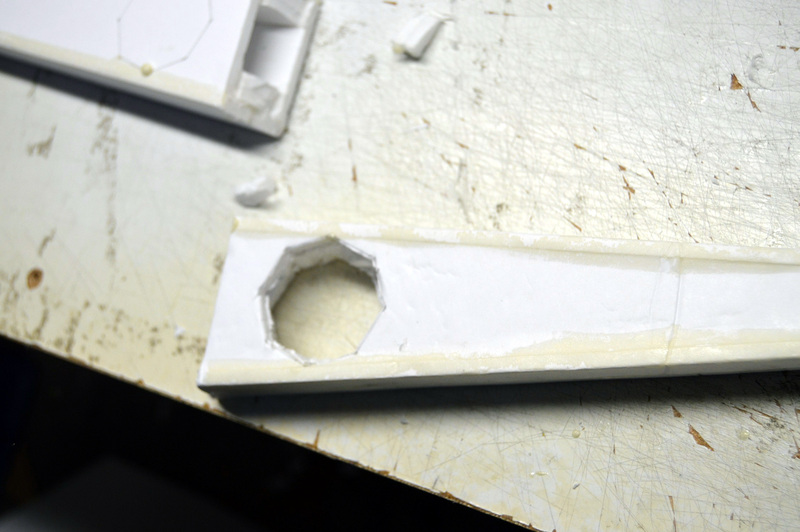 When the glue was set, the hinge line was score cut down to the tape and then a bevel was cut about 1/8th inch back. It was my intent not to use any wood, carbon fiber, or metal on this build but the v-tails were the first (and not the last) occasion where I had to break this self imposed rule. There was no way they were going to support their own weight at the root without some reinforcement which came in the shape of short lengths of paint stir stick cut to length and installed in a trench cut into the root of each v-tail. 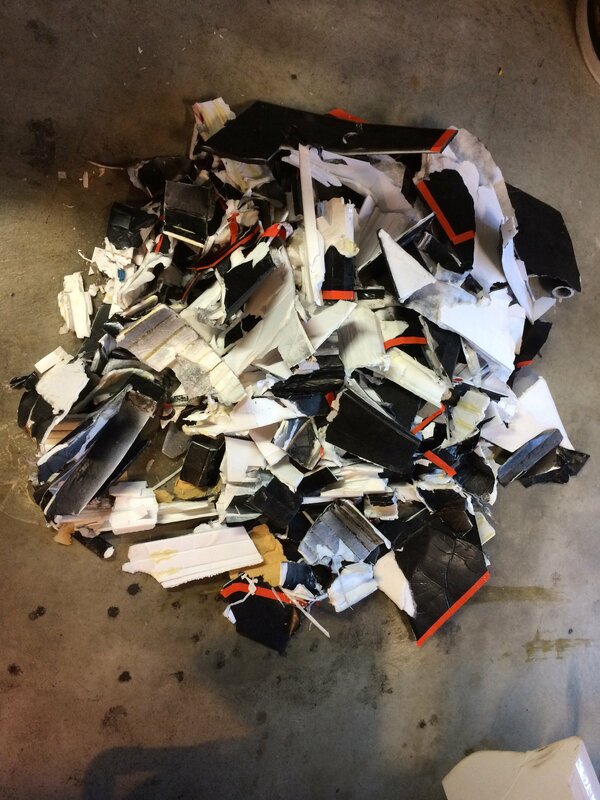 The original foamboard tabs were removed. 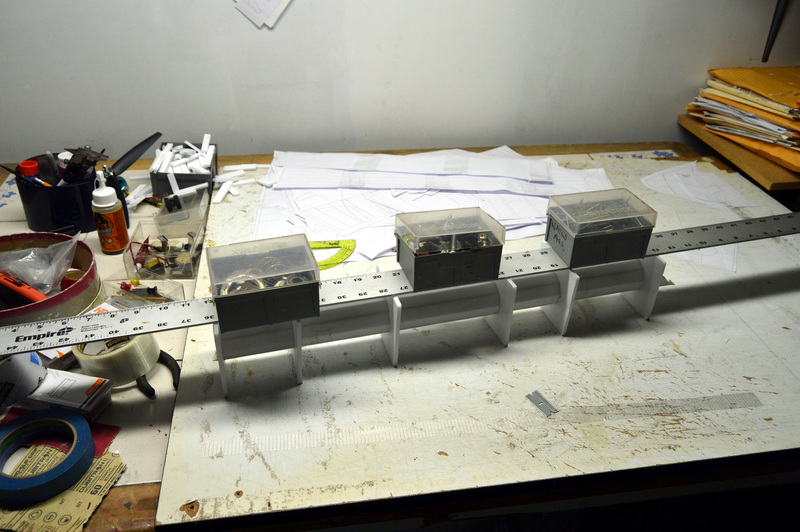 The servos were also pocketed into the underside of each v-tail. Wings were dry fit onto the pylons until I was happy with the fit. The install involved applying copious amounts of carefully placed gorilla glue on the pylon and sliding the wing into position. 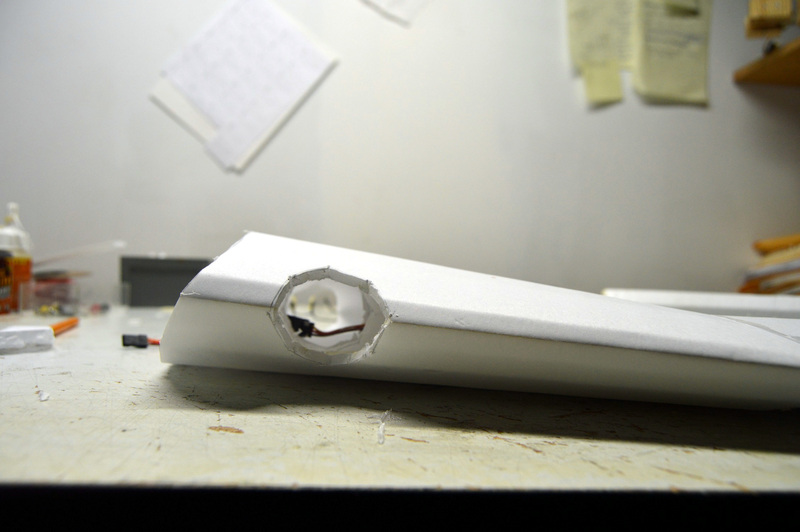 Two foamboard pins were then inserted through the root of the spar, through the pylon and into the inner portion of the spar. 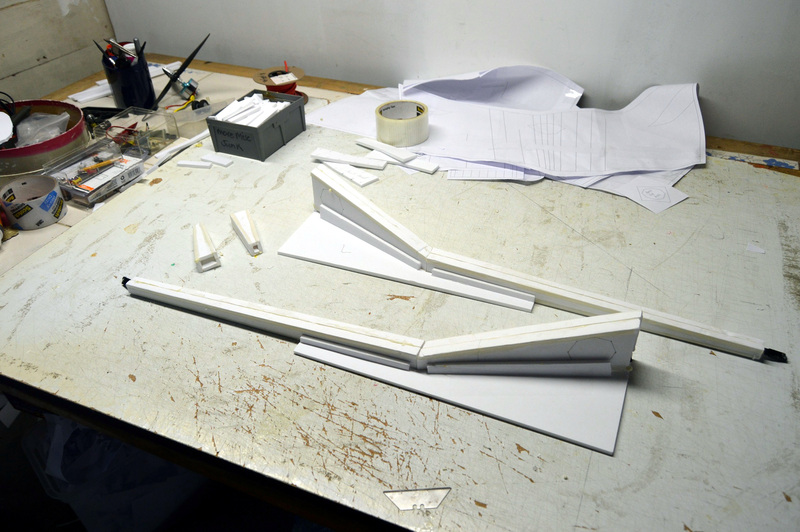 The wings and pylons were then setup in frames, with supports under the wings to keep them properly positioned until the glue set. This process went pretty well except for the aileron servo connections. I had run the extensions through the spars which meant they interfered with the insertion of the pin and another short extension needed to be added so that I could hold the servo wires firmly as I inserted the pins. This was pretty messy. 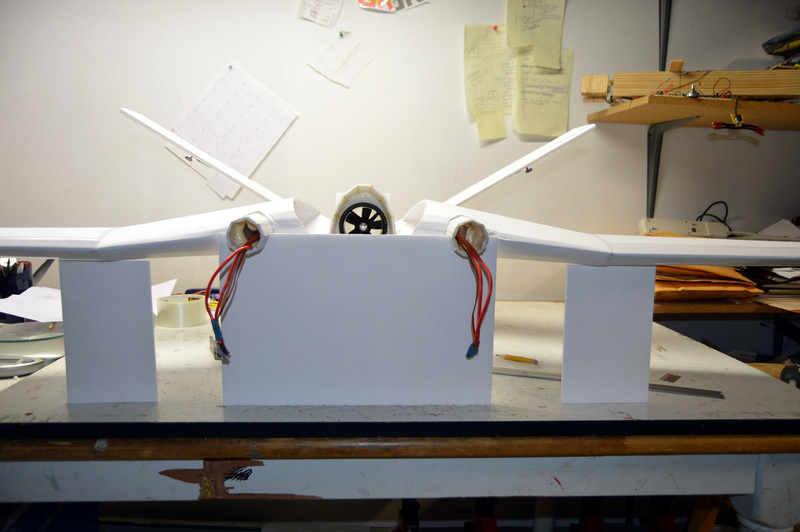 Once the glue was set, the supports were removed and I was pretty happy with the lack of slop in the wings. Yes, there was a little flex along the pylon, but nothing major. 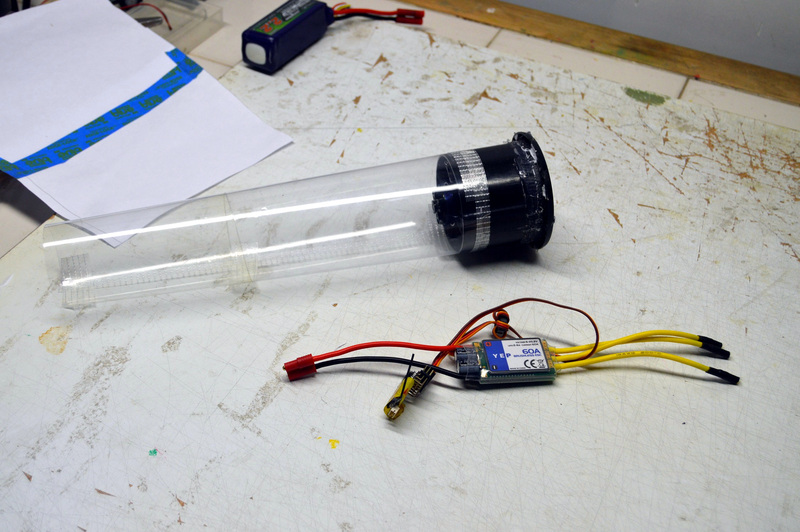 Each battery pod consisted of a tube to extend the pod forward and the pod itself. These were straight forward parts to fold and glue. 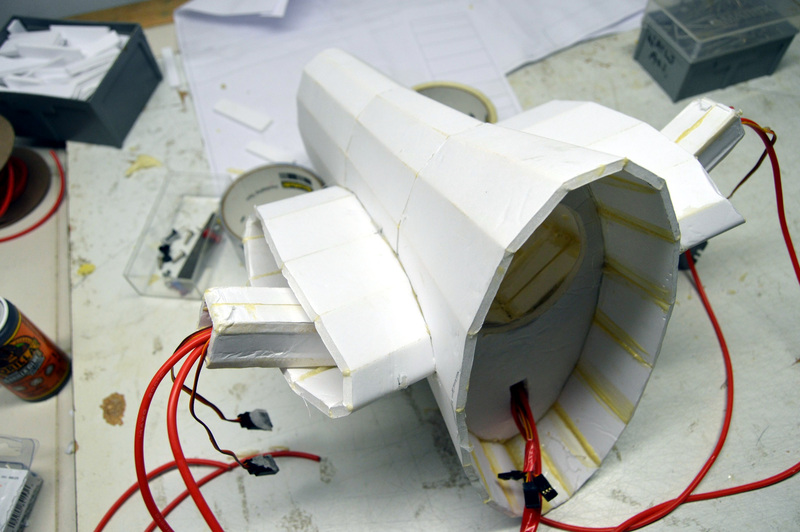 Once the tubes were set, they were glued in through the back wall of the the pods which had double layers of foam added. Before installing the pods permanently, I did one last check to make sure the fully assembled plane would fit into the car. The power wires were snaked through the tubes into the pods and the units were gorilla glued into the pylons. These were held in place with some painters tape while the glue set. 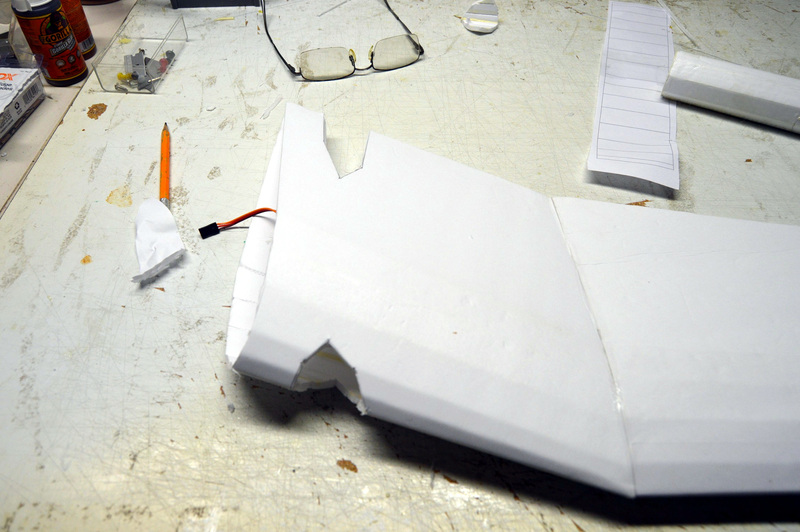 Hatches were cut into the battery pods and some velcro added to the inside floor to hold the batteries in position. When the pods were set, I was not overly happy with how strong the tubes were. 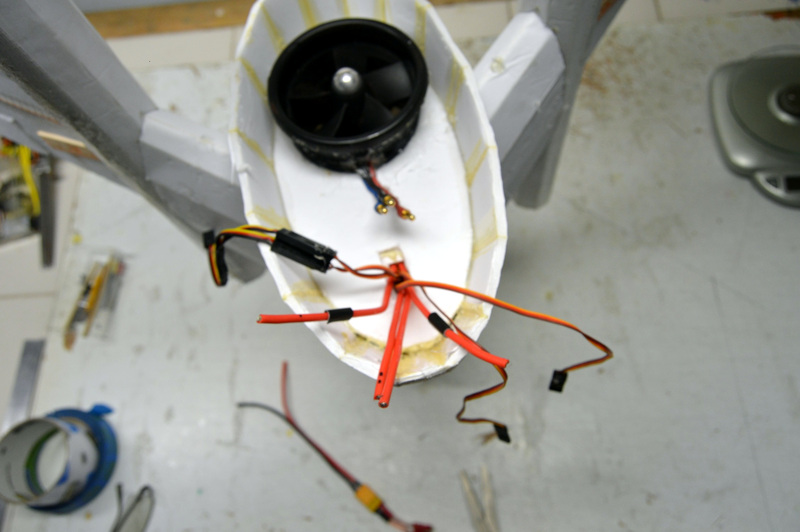 When a 2200mAh 4S battery was installed in each pod, they sagged a little. So time to break the rule again and add some carbon fiber tube to the bottom of the tubes. This helped a lot. 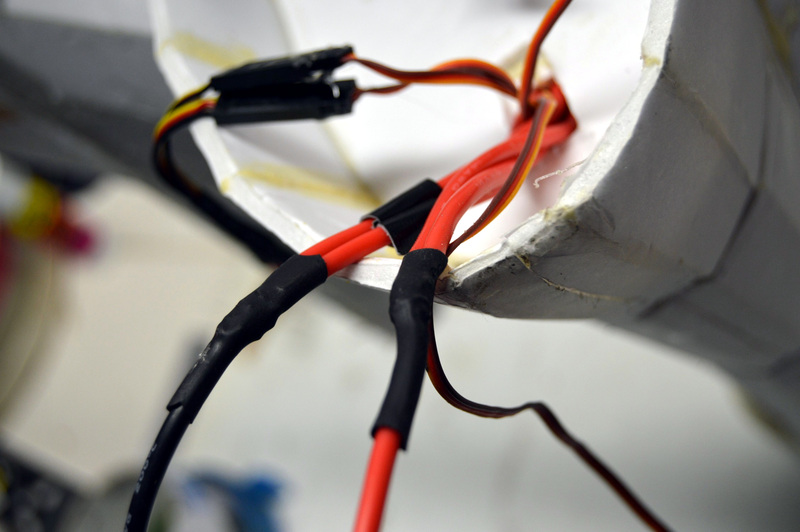 Two 14 gauge wires now run from each pod through the pylon to the fuse. Of course I didn't label them and they are all red. I used a multimeter to confirm which wire was which before soldering the various connectors. I like to use the wire warp method for soldering like this - wrap the two bare ends to be soldered tightly with a narrow strand of wire and then just flood the joint. A little heat shrink and their done. 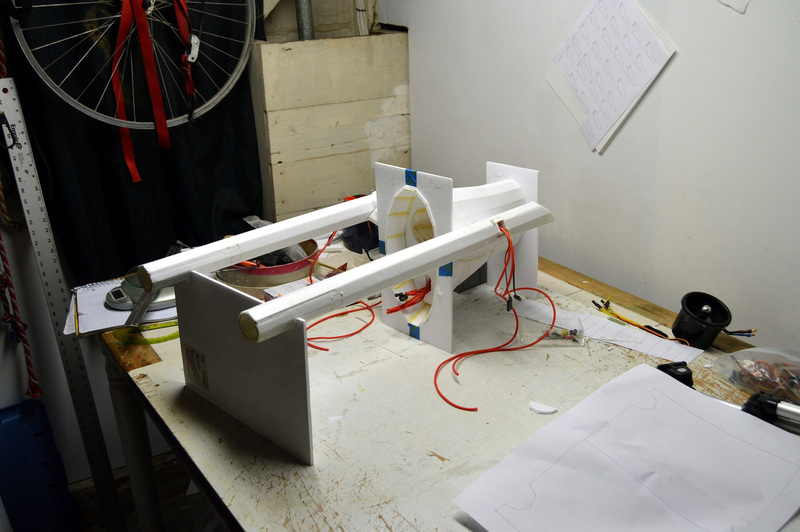 With the wiring done the seat could be glued in place. Last pieces to be added were the front leaves for the fuse. The paint job was just an all over rattle can black, about 3-4 light coats to cover. Then the accents were added using an orange tape (a little lighter than duct tape). Some of the key stripes / patterns from the plane in the movie were retained and some striping was a little ad hoc. Tape is a little rough looking inside the 5 foot radius but I'm sure that in the air (if if ever gets there) it will look fine. 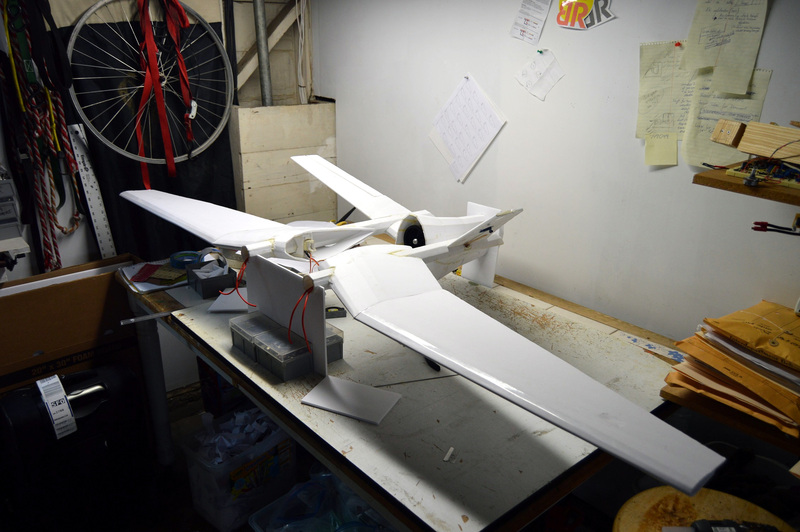 Pics of the final build prior to maiden. Post originally reserved for additional build content which was not needed. This is gonna be awesome! I just got the tron legacy movie from the library after I saw this. Introduction post updated and quite a bit of content added to the Design post (#2). I need to learn to do what you just did design wise! REALLY, Awesome. How did I overlook this one. Will be following this for sure. Great start Damo. Thanks! I don't think it will have as many parts as the 540 but it's not going to be an easy build by any stretch! Updated the design post with the latest work where I am trying to add the details of how she'll actual be constructed. Can barely focus to see this tiny phone atm. Will come back with fresh eyes and read up on the first post and catch details on all you have done. From what I can see in the pics this will be a crowd pleaser for sure. Keep at it! I can't wait for this hard copy of this. knowing you, it will be something to behold. Have made quite good progress on the build, just haven't had a chance to write up and/or add the pictures to the build post. Overall, its a little rough around the edges, but its getting there. Some pics of the parts dry-fit together. Your builds never cease to amaze me! In two minds about this thing. On one hand I think she looks pretty cool and is a reasonably faithful re-creation of the model. On the other hand I am not getting that warm fuzzy " sure - she'll fly - no probs" sense from her. Weather is supposed to be good all this week and given questionable maiden success I think I will finish her up, paint and stripes, and at least get some trophy pics before I launch her into the hands of the maiden gods next weekend. Well, it looks fantastic. So even if the maiden doesn't go well at least it'll look good! Good luck, hope to see some vid of it flying! This build makes me happy. I was wanting to it aswell in the future. You might need a dummy tho on the seat to balance it out. maybe I missed something but where do u plan on putting the battery?